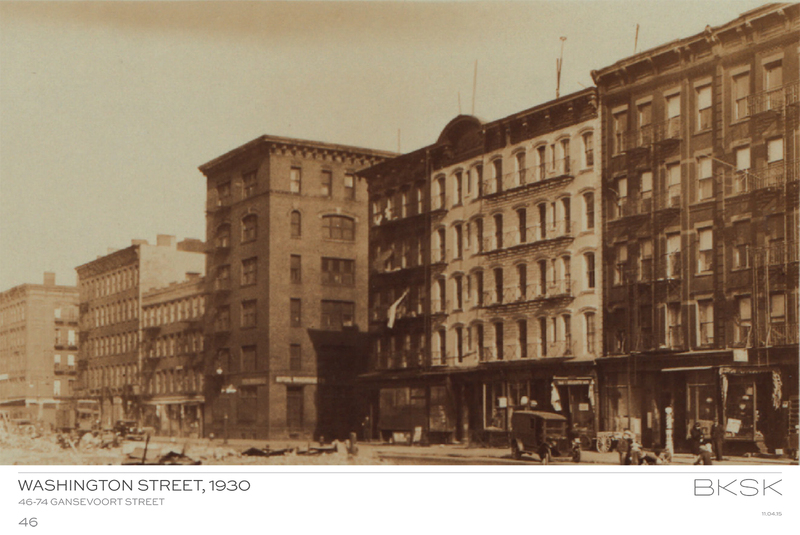 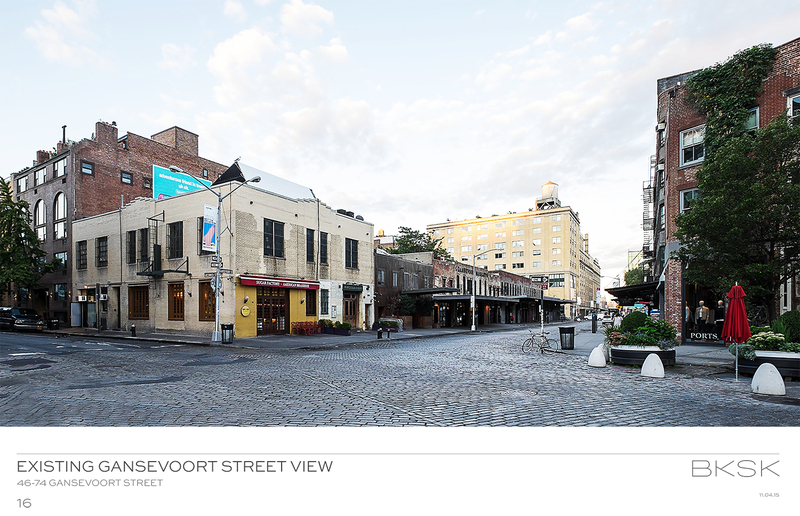 Gansevoort Street as it exists. 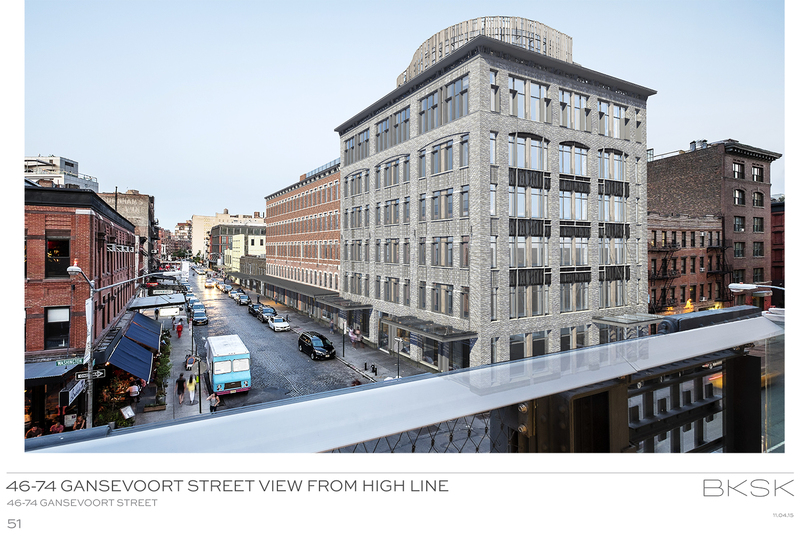 The project was presented by Cas Stachelberg of the preservation firm Higgins Quasebarth & Partners and architects Harry Kendall and Todd Poisson of BKSK Architects. 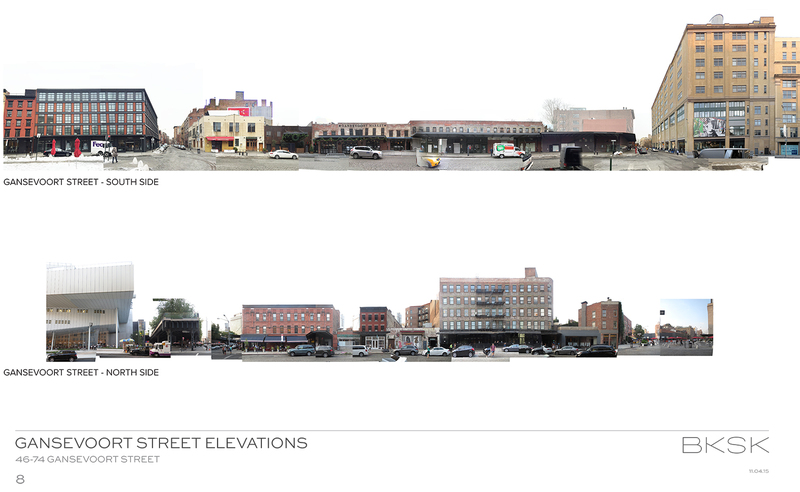 Here is a summary from east to west. 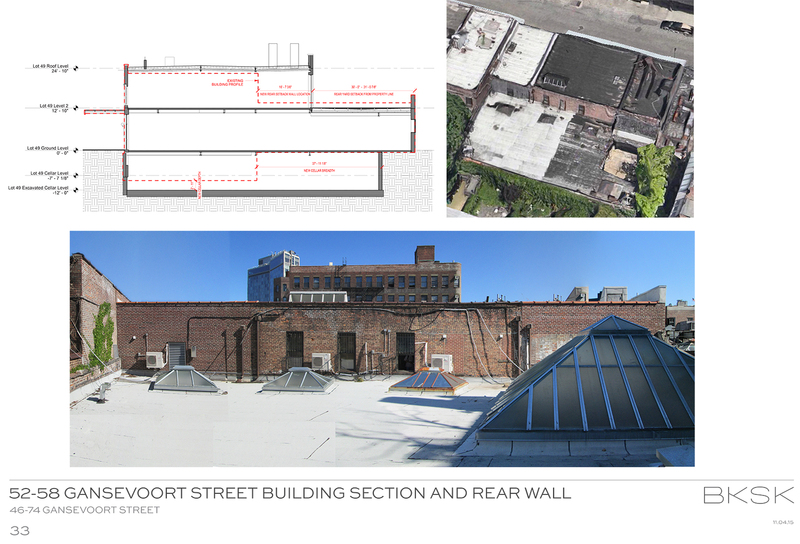 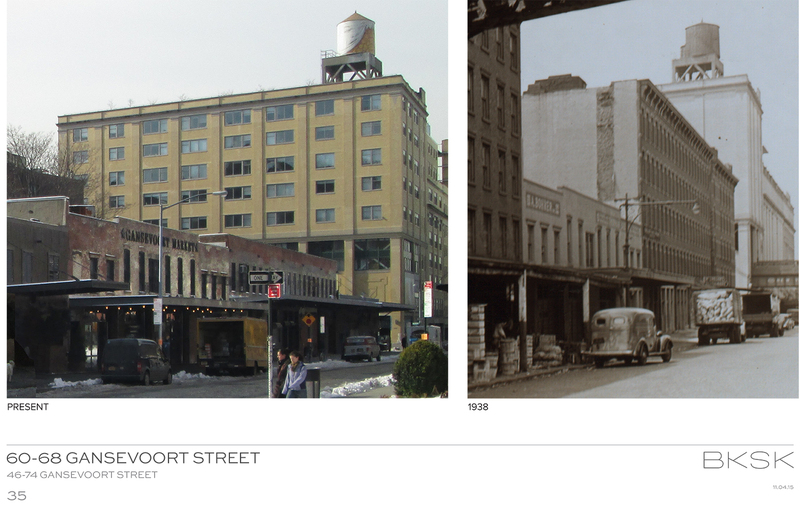 Two-story 46-48 Gansevoort Street would be largely preserved as it stands right now, though the skylight would be replaced and new marquees and signage would be added. 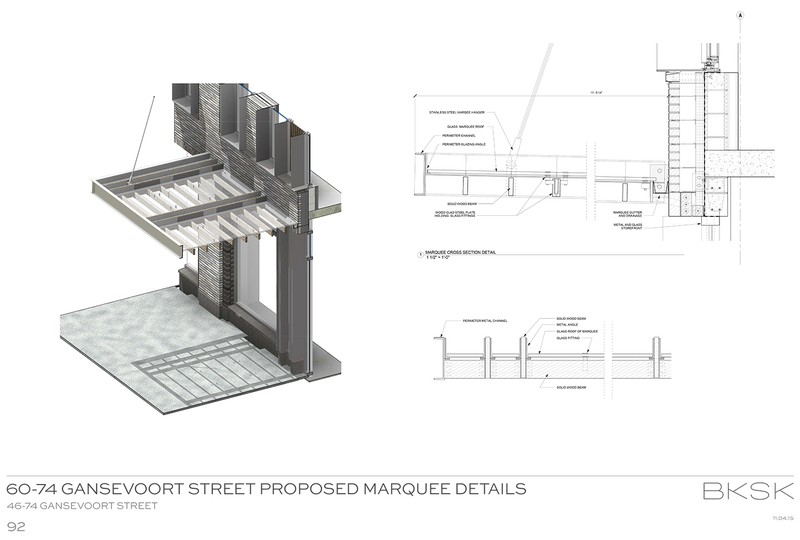 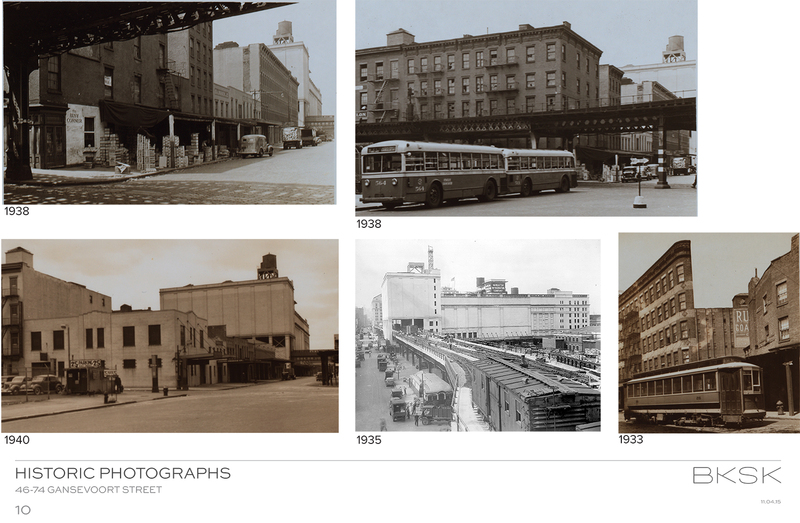 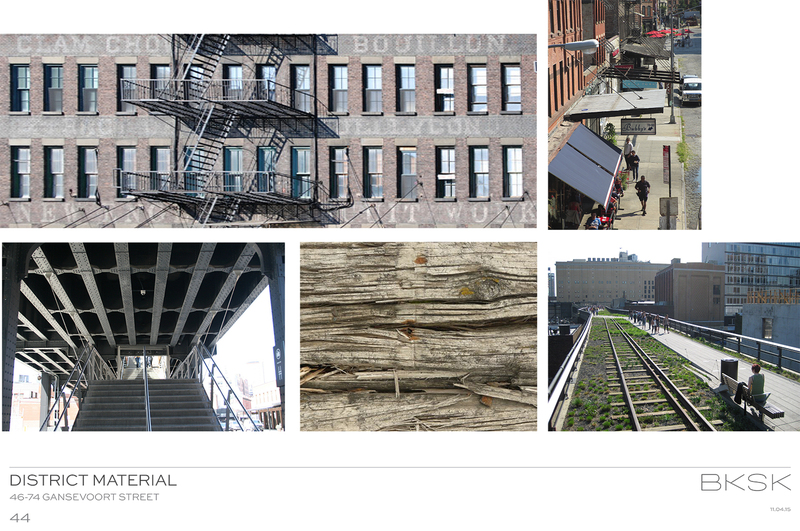 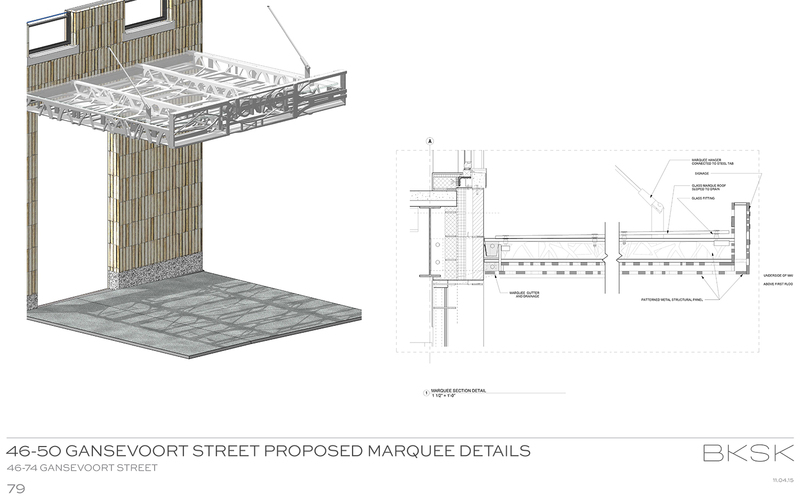 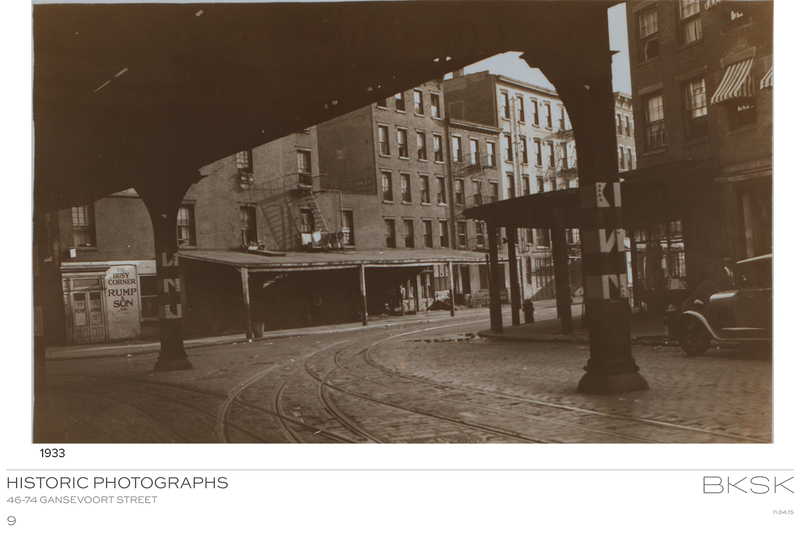 Poisson said the marquees would echo the shadows that were once cast by the Ninth Avenue elevated train line. 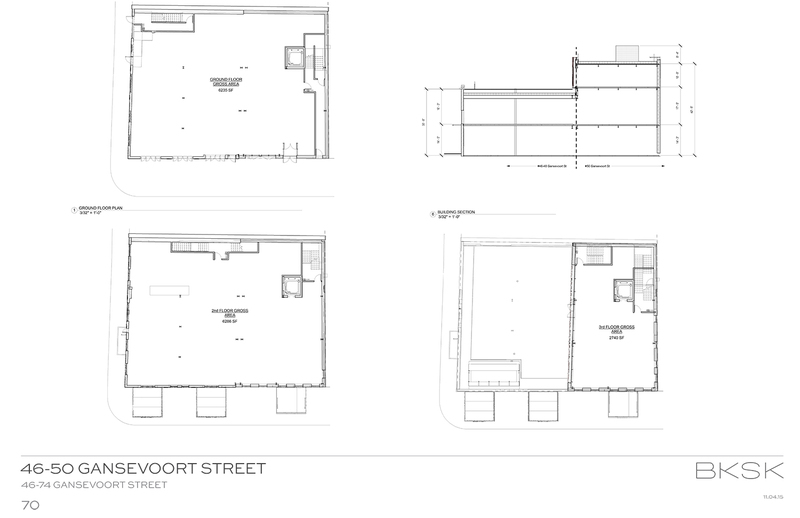 Total square footage would be 7,075. 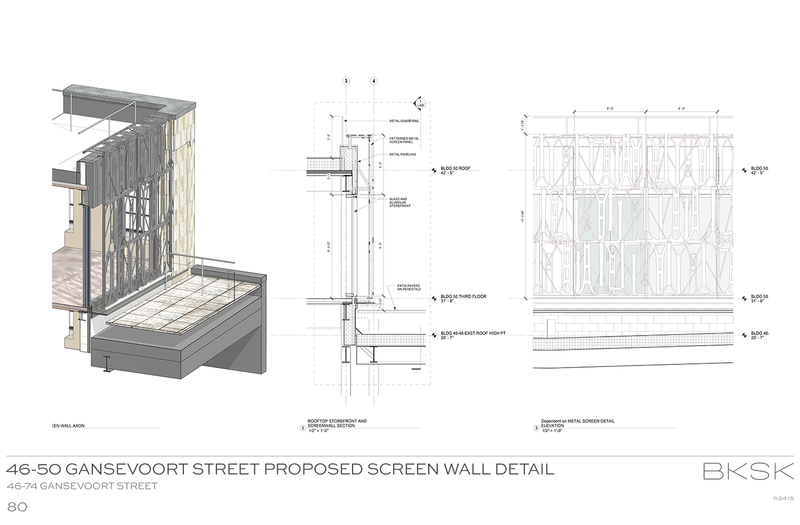 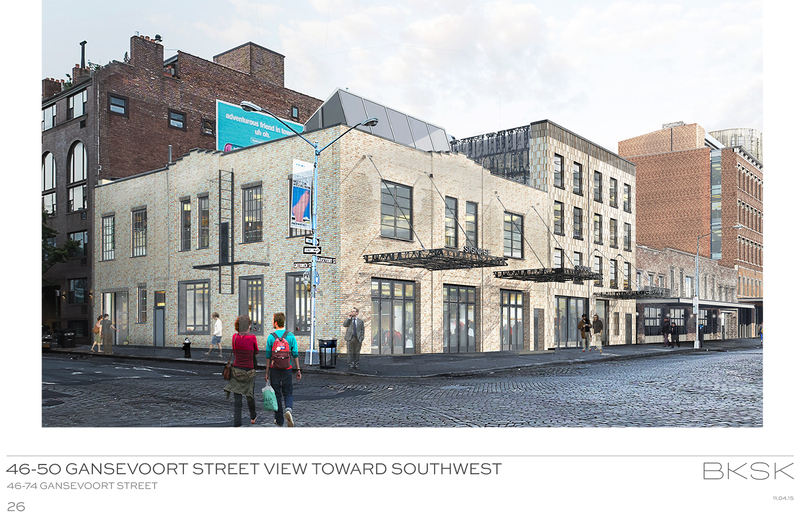 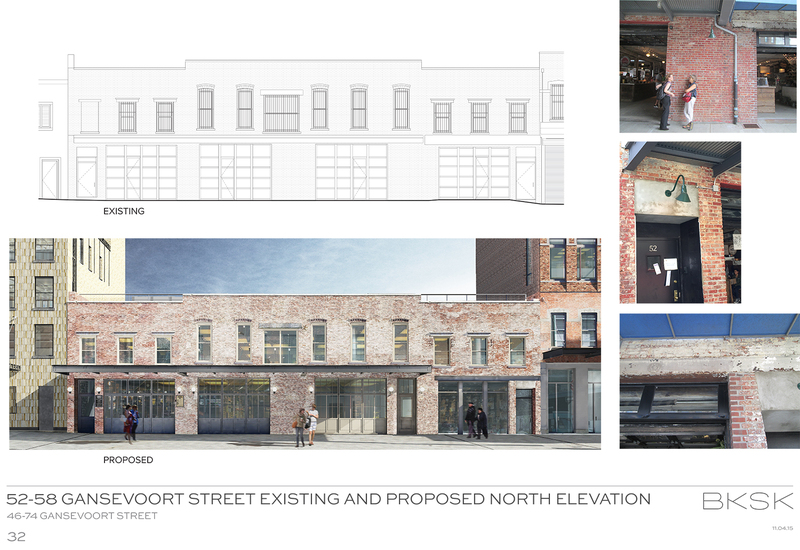 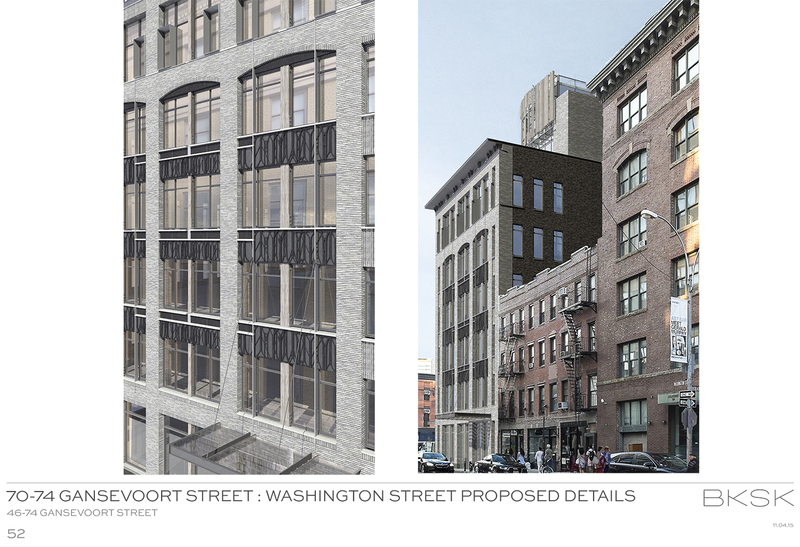 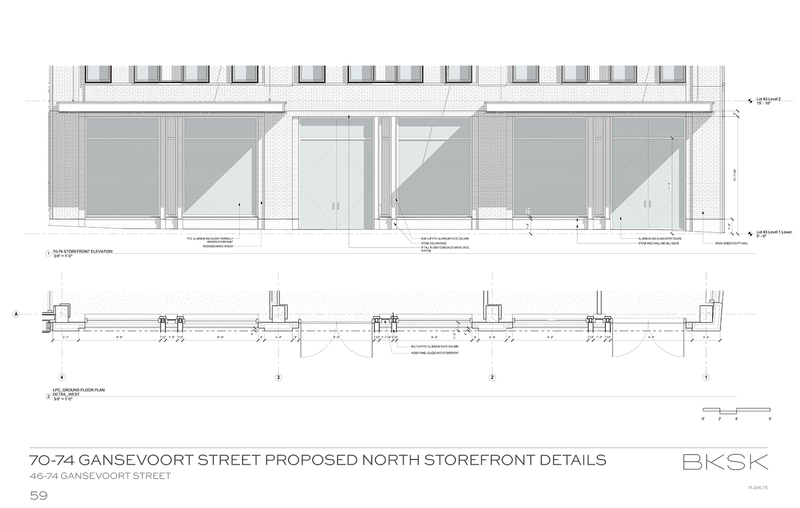 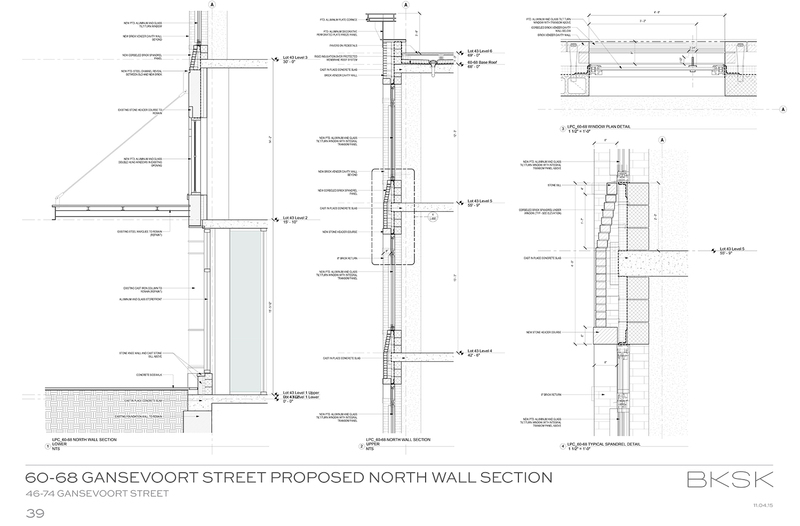 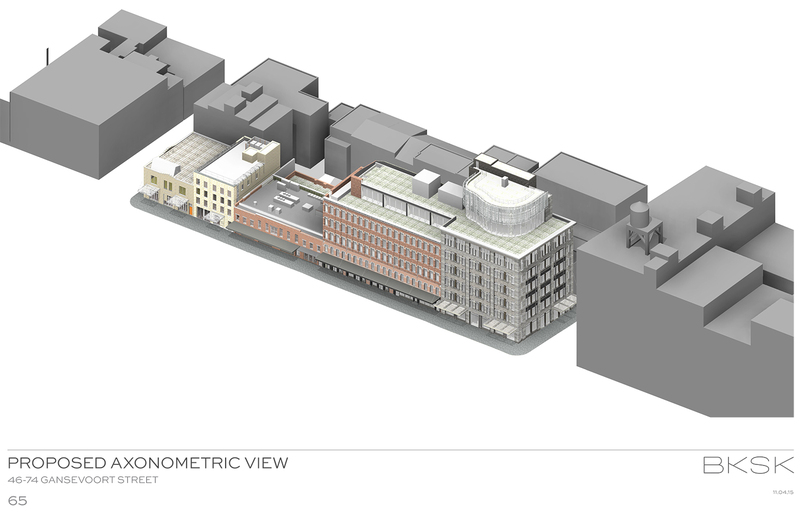 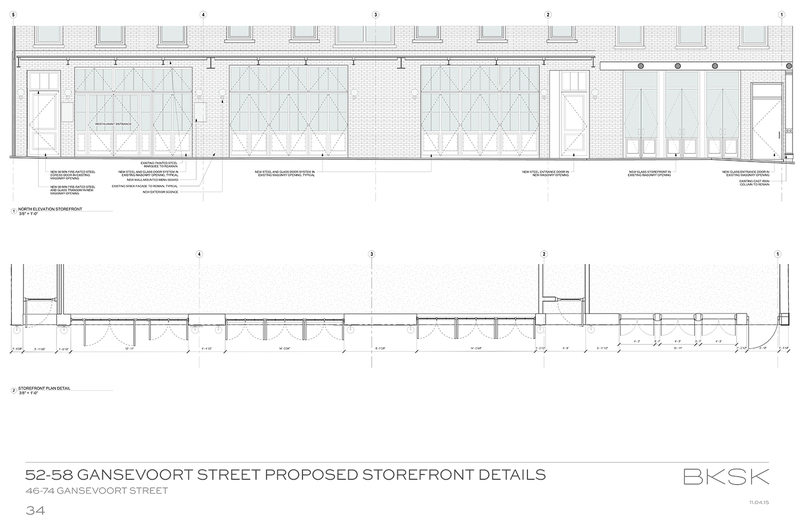 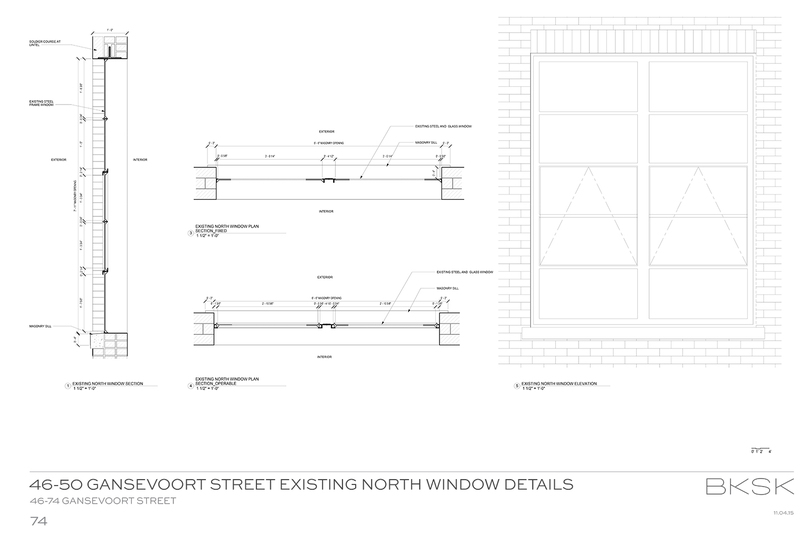 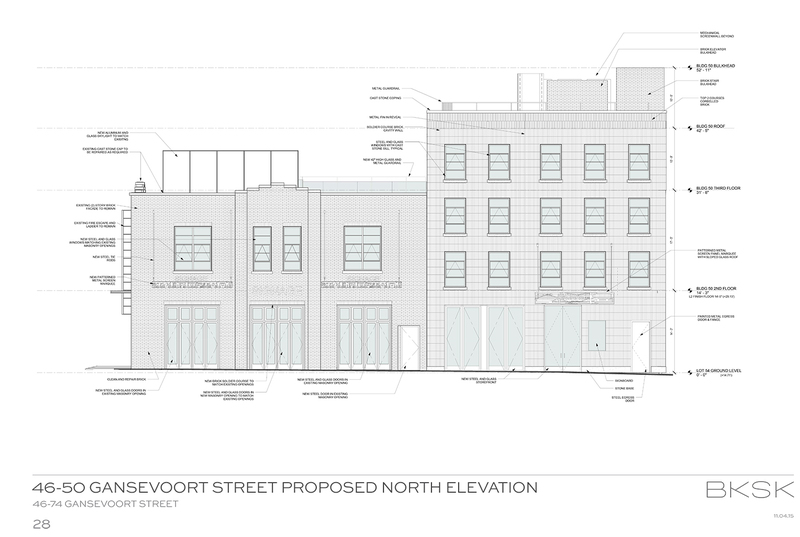 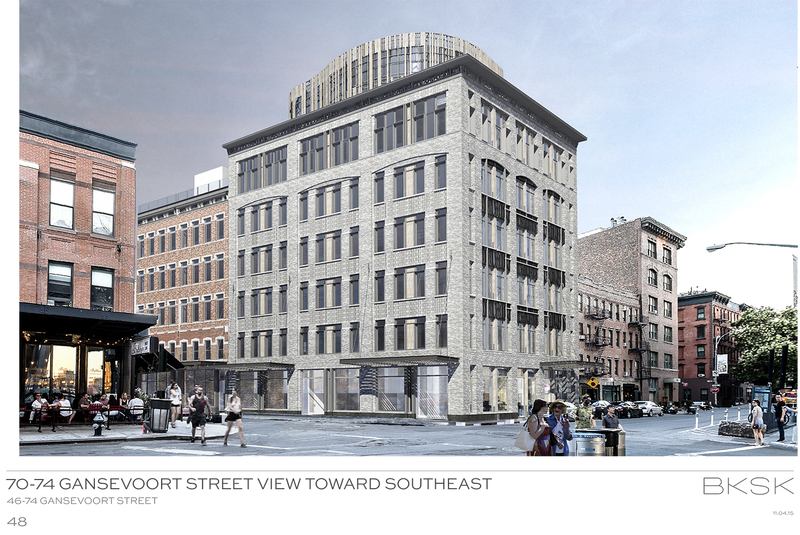 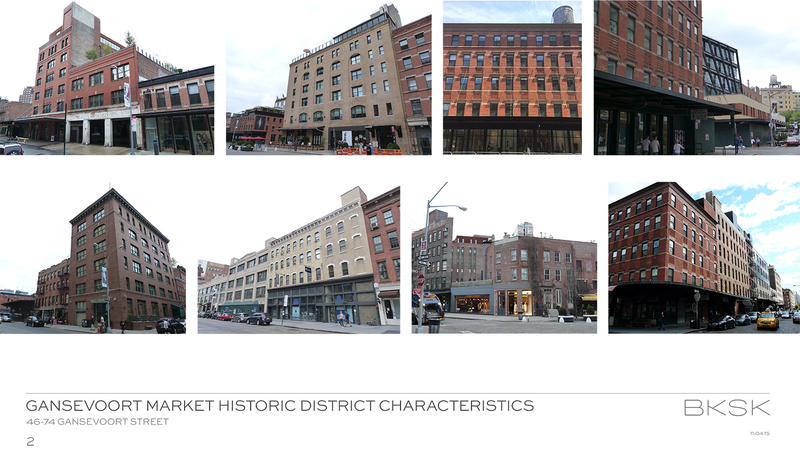 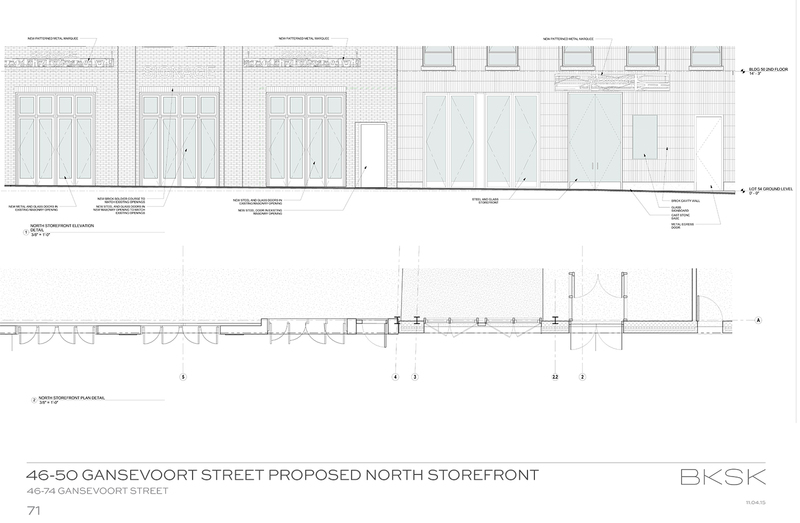 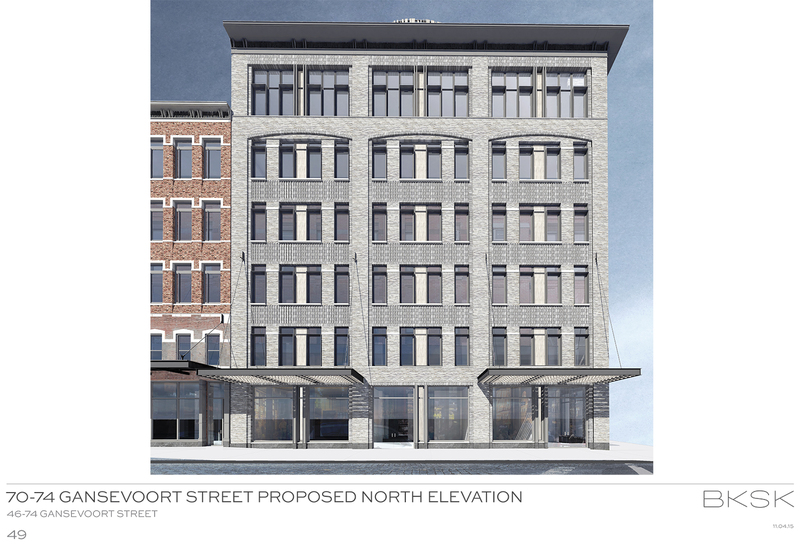 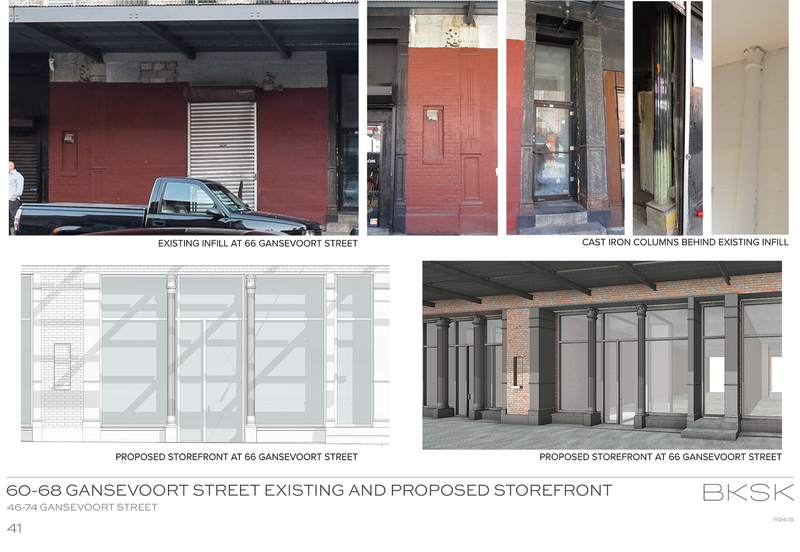 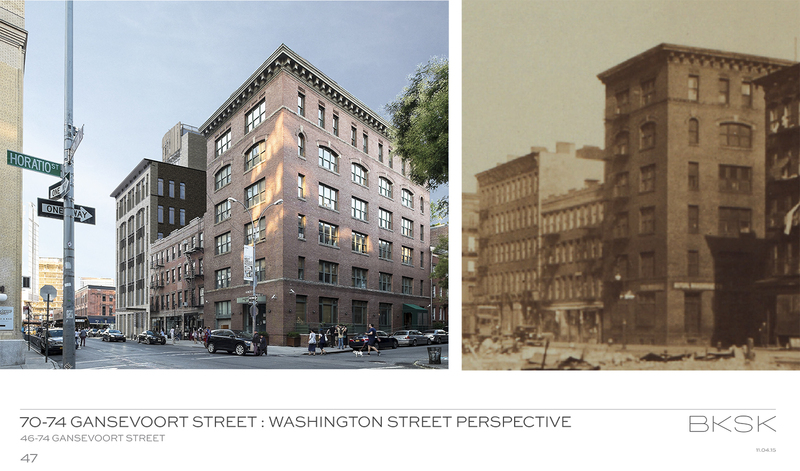 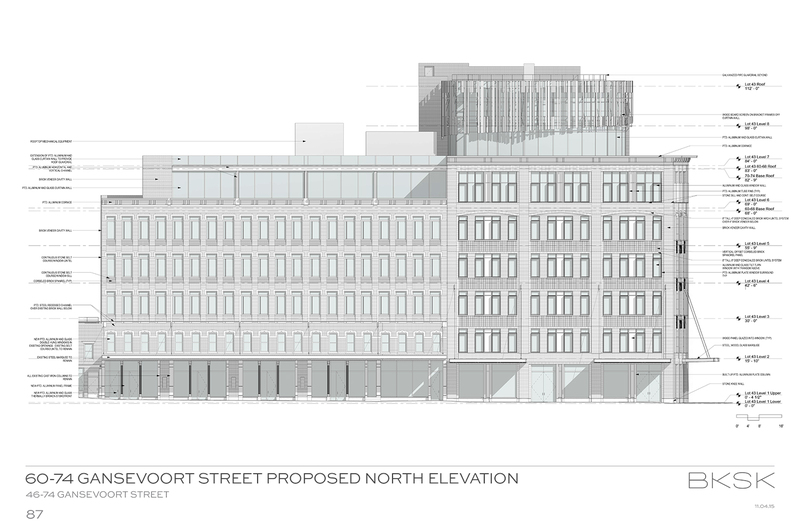 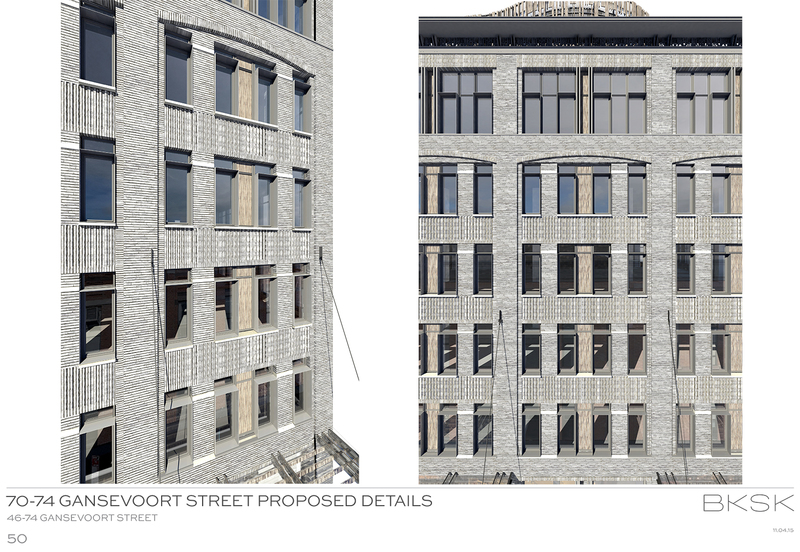 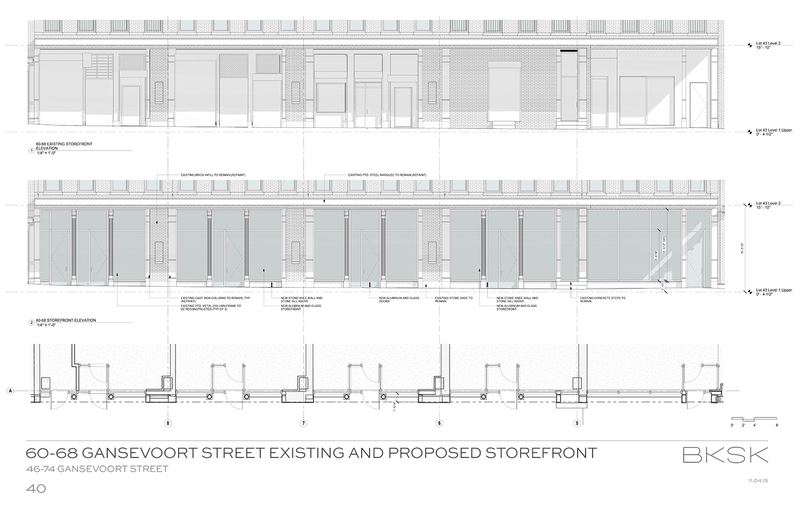 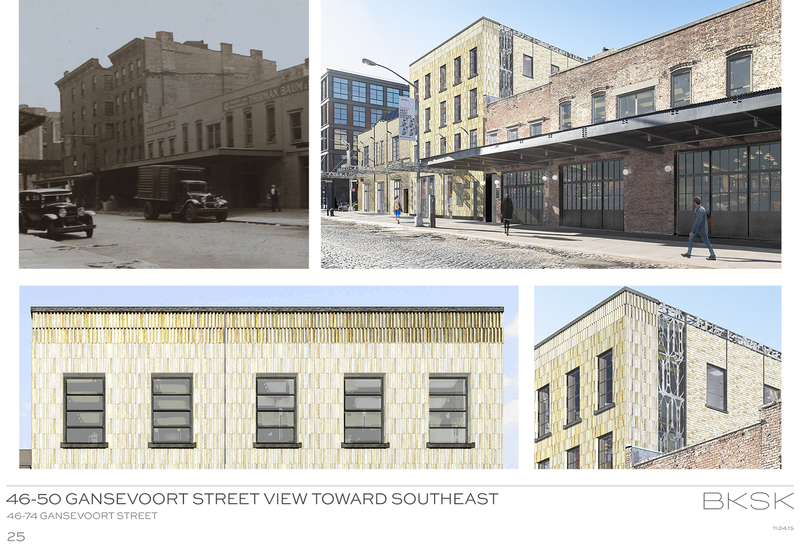 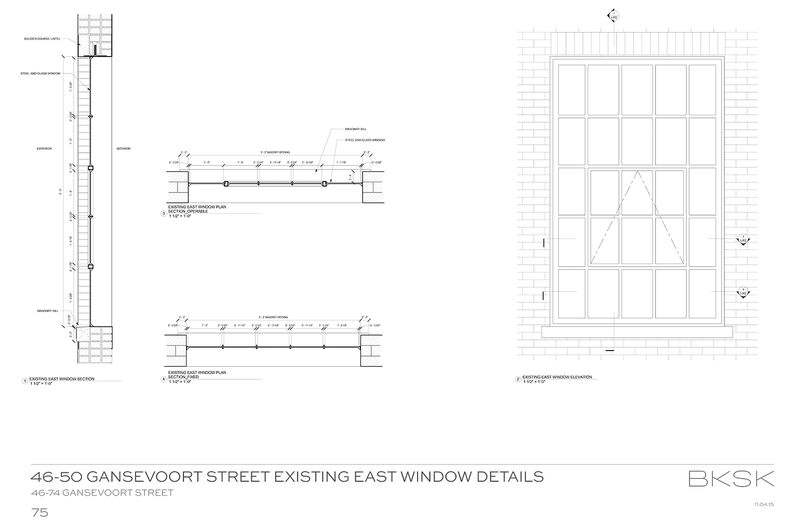 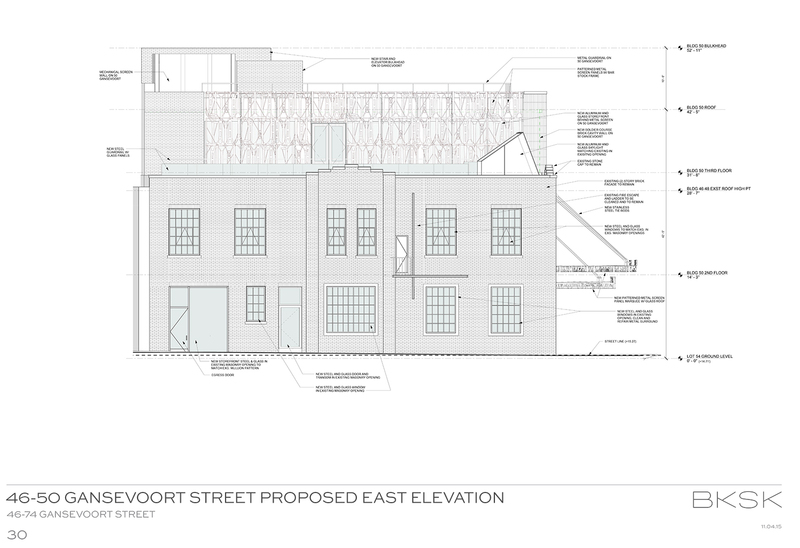 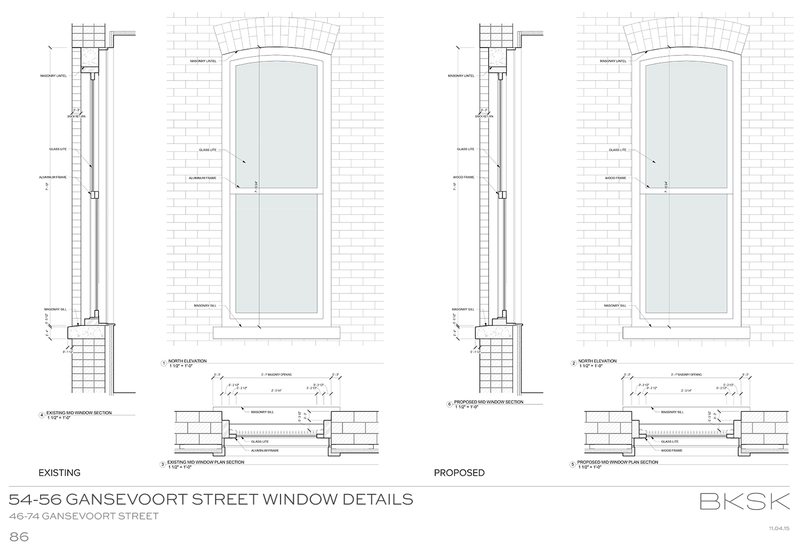 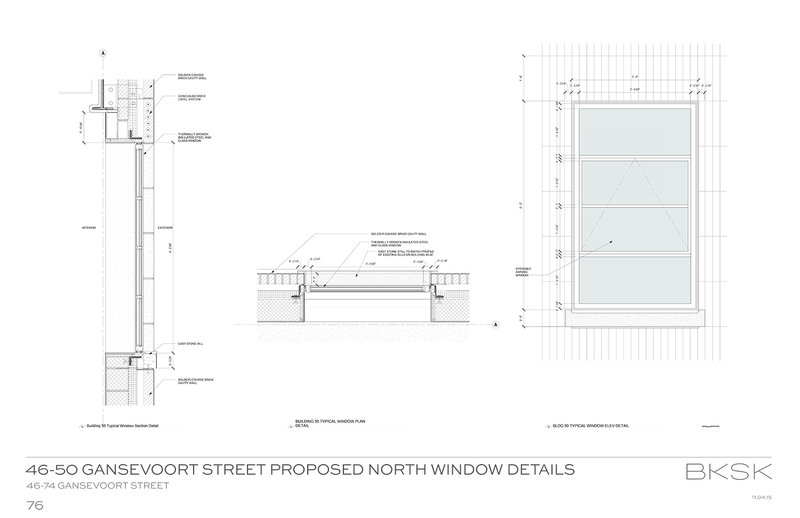 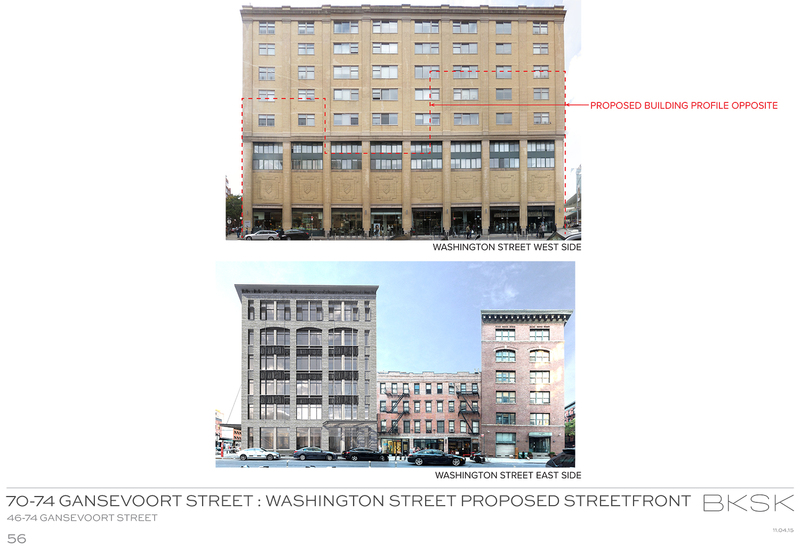 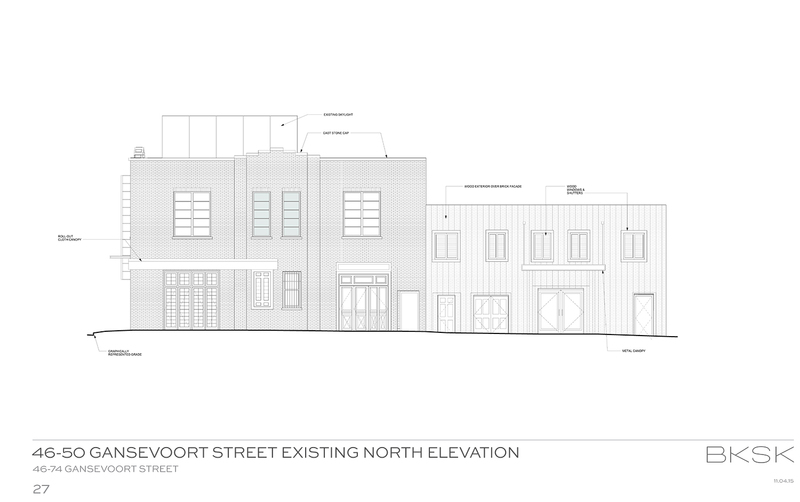 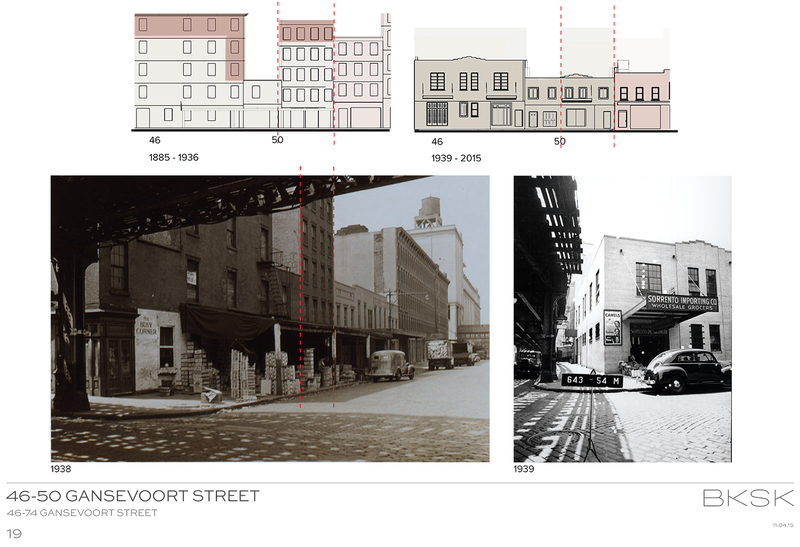 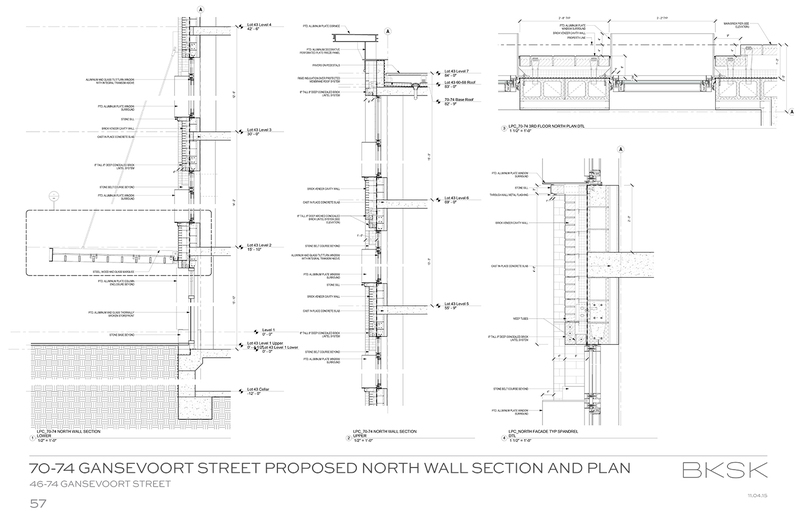 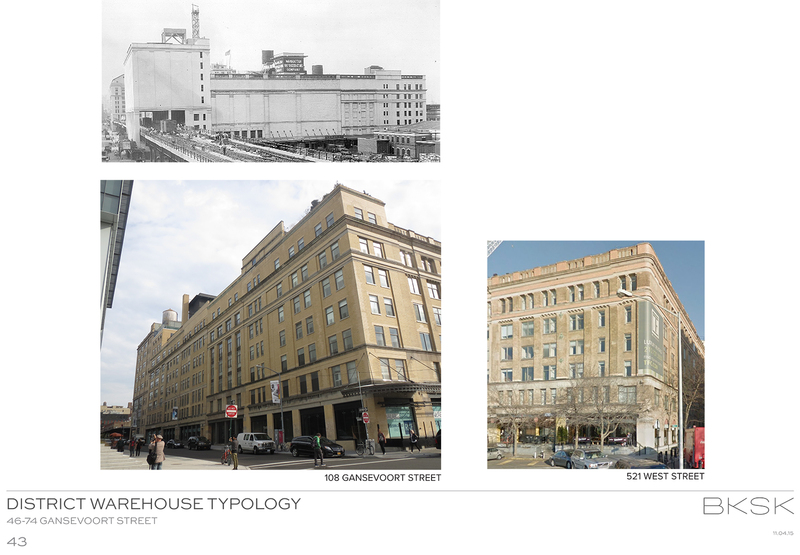 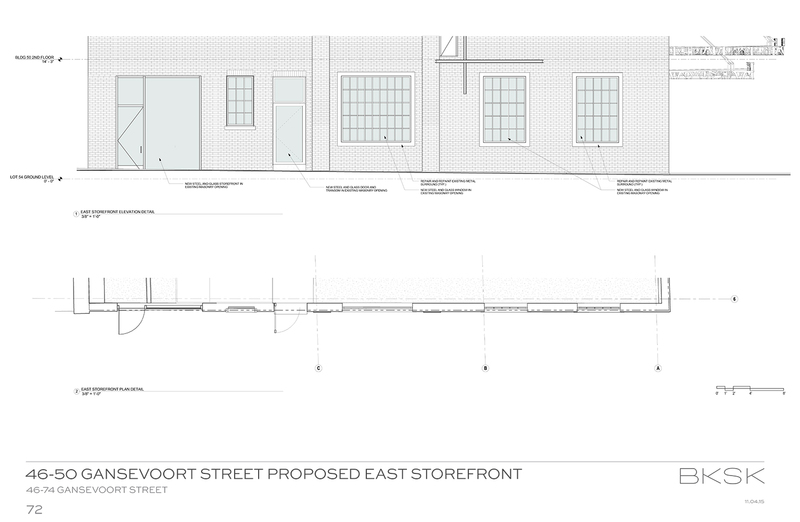 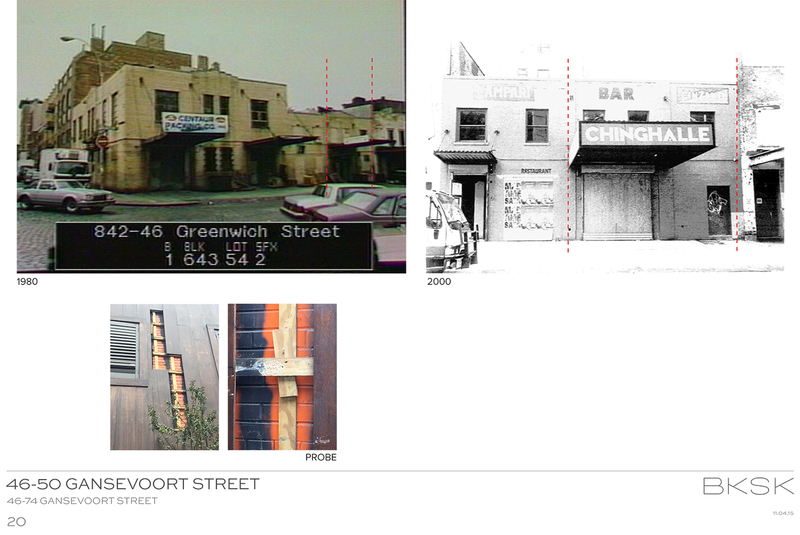 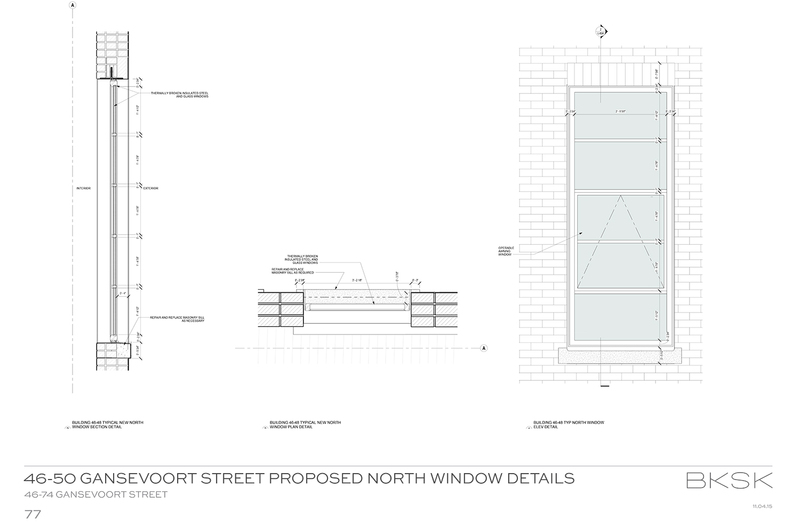 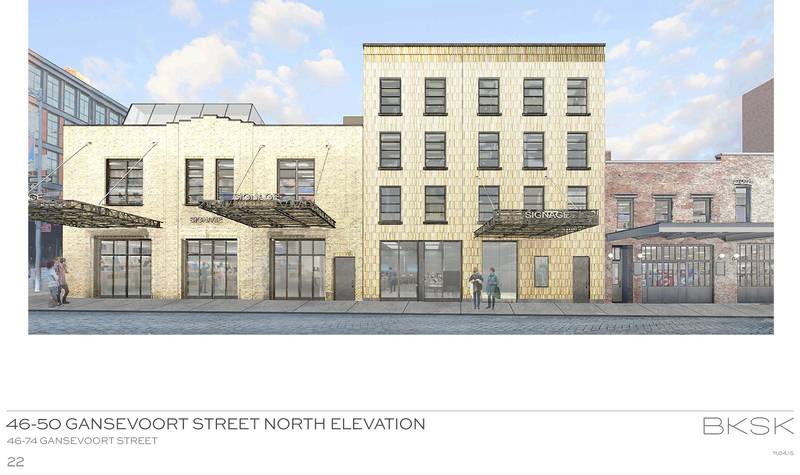 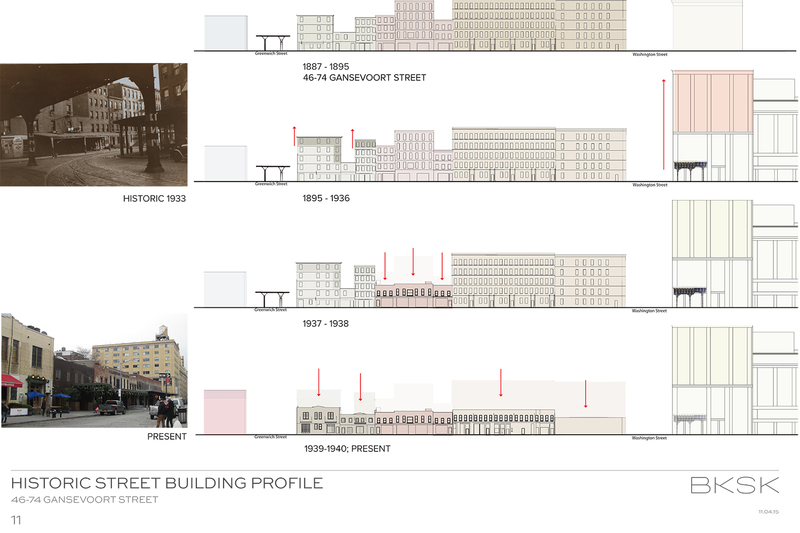 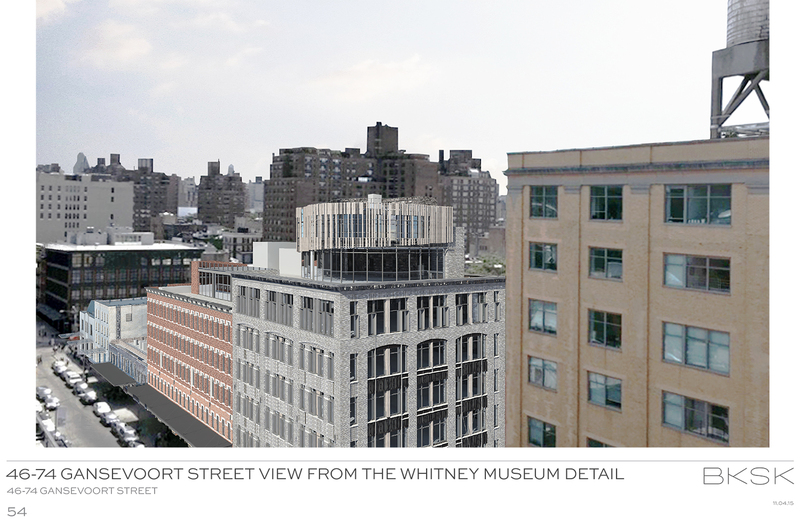 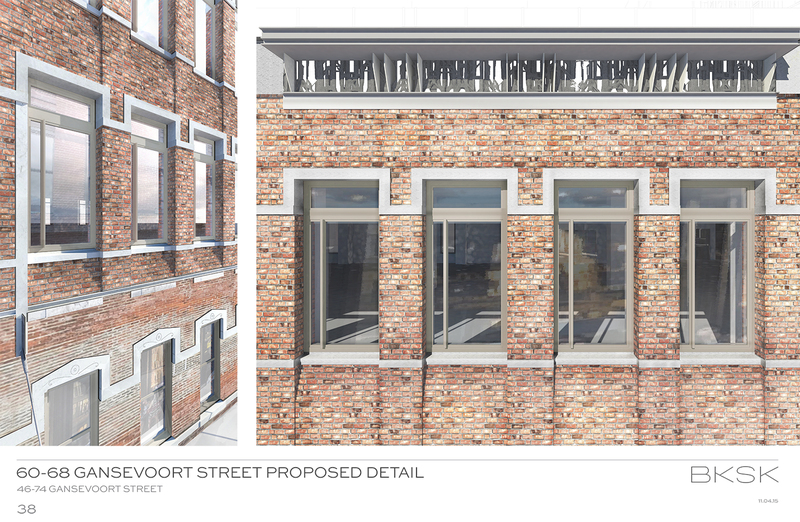 Two-story 50 Gansevoort Street, which was recognized in the Gansevoort Market Historic District designation report as being clad in no style (in other words, no architectural style), would be demolished and replaced with a new three-story building mimicking a four-story building. 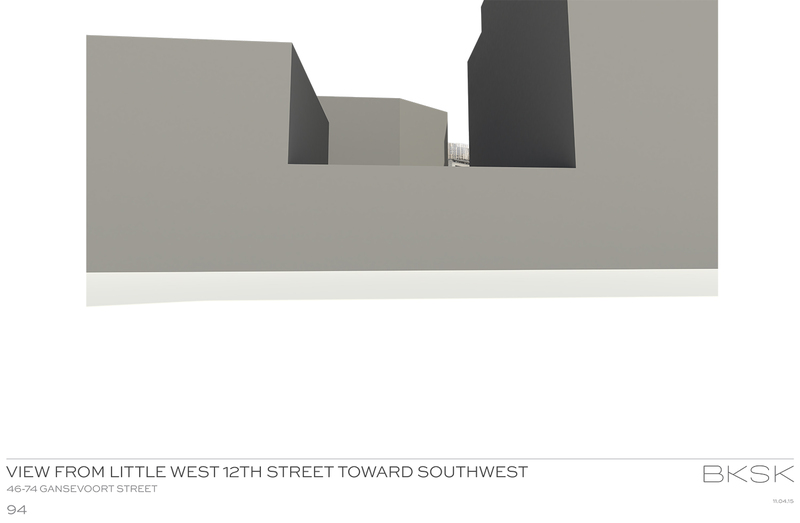 Total square footage would be 8,382. 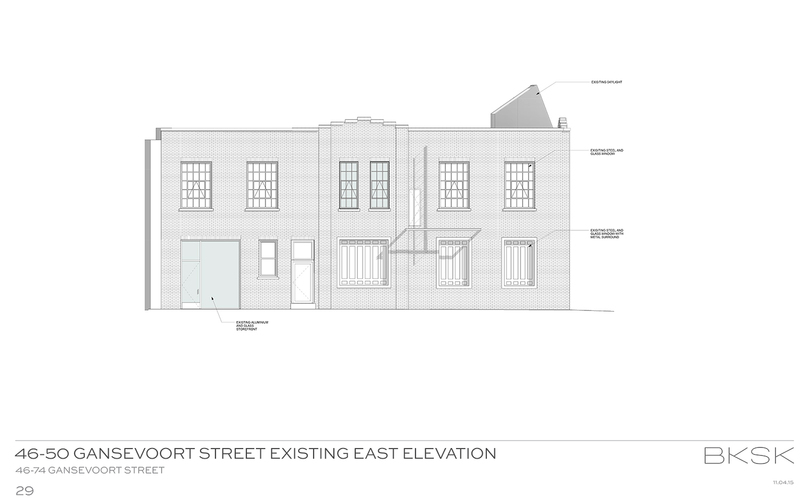 That’s up from the current 5,350 square feet. 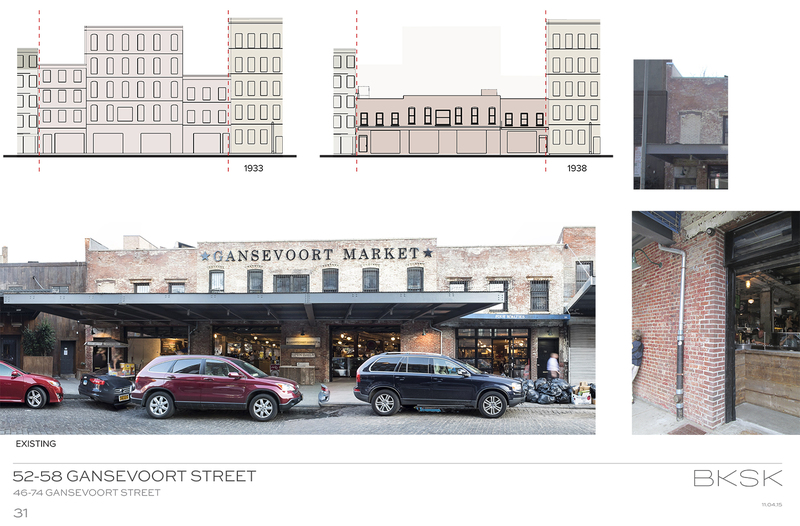 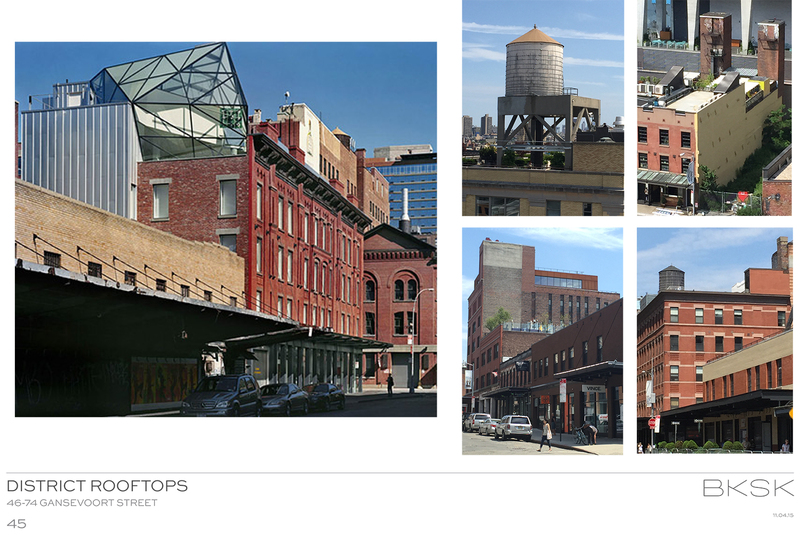 52-58 Gansevoort Street, the central Gansevoort Market building, would remain a two-story building, though the letters reading “Gansevoort Market” would be removed and new doors and windows would be installed. 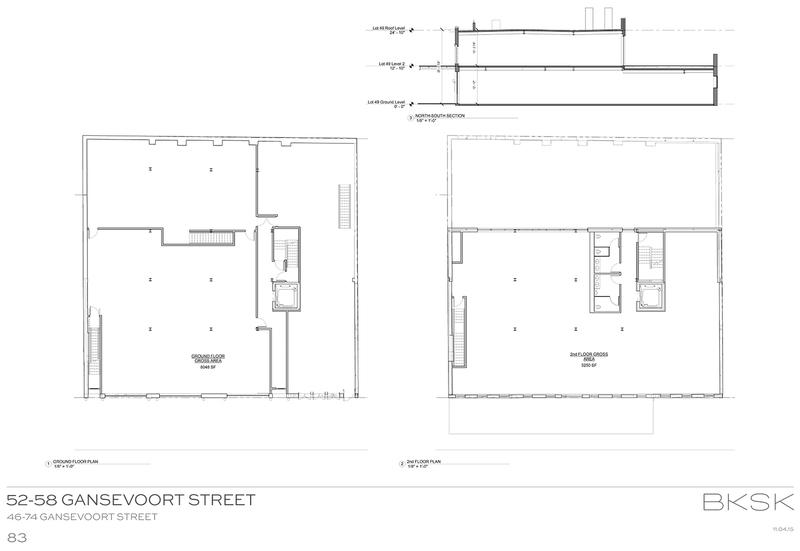 Total square footage would be 13,325. 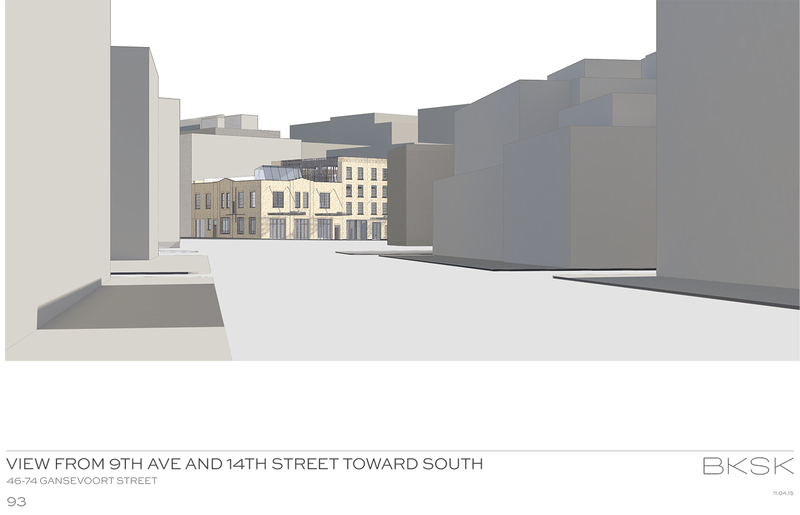 It would also house the new version of the restaurant Pastis. 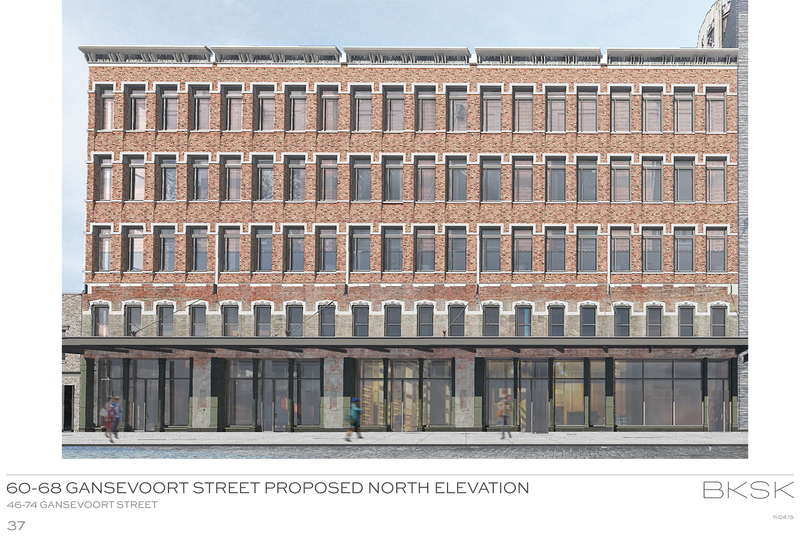 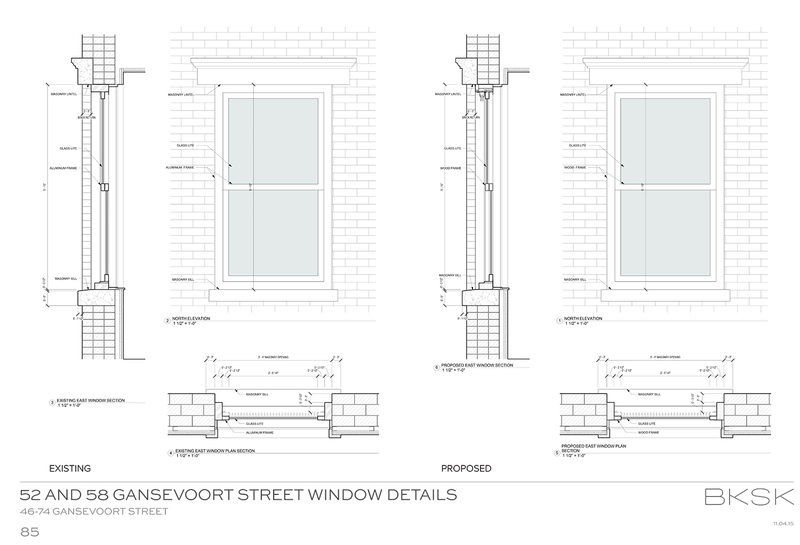 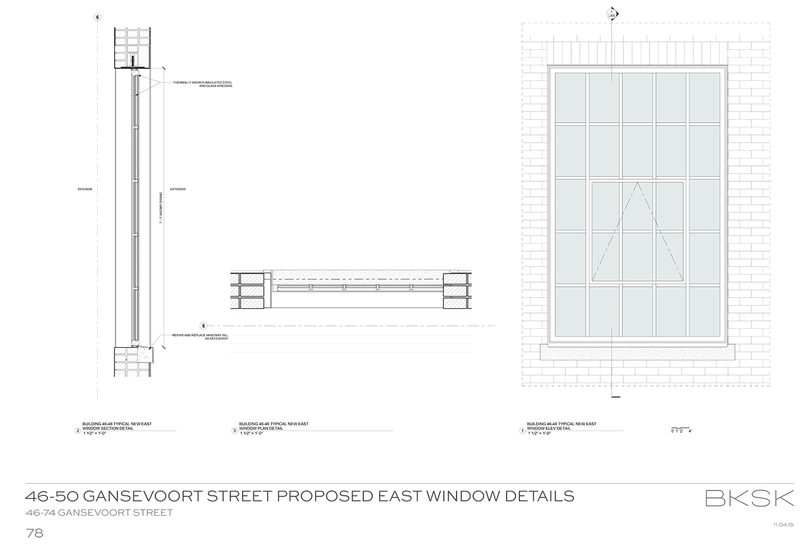 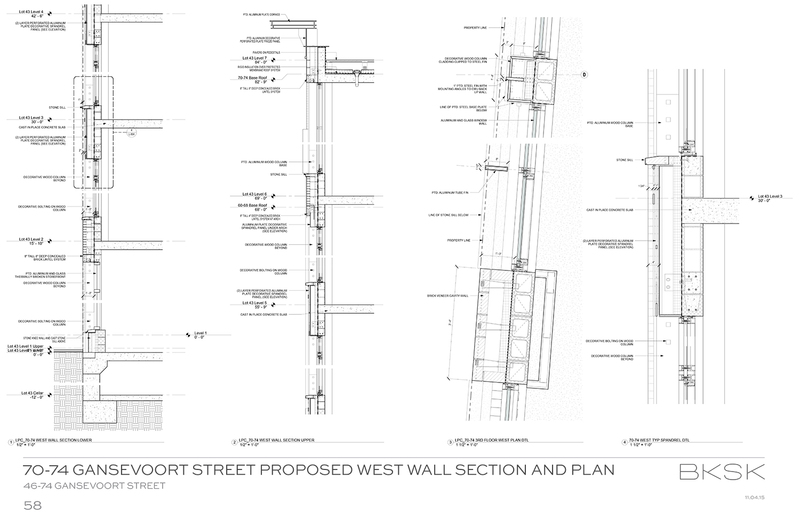 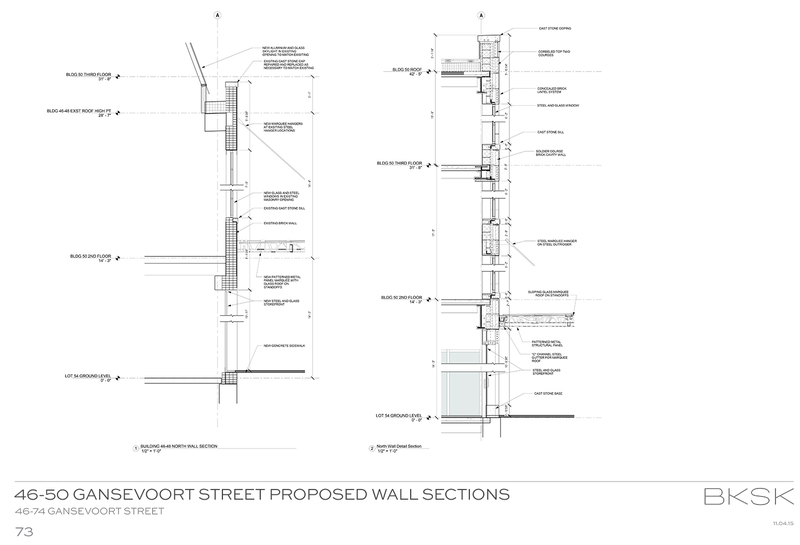 60-68 Gansevoort Street, currently two-stories-tall, would be expanded vertically to six stories. 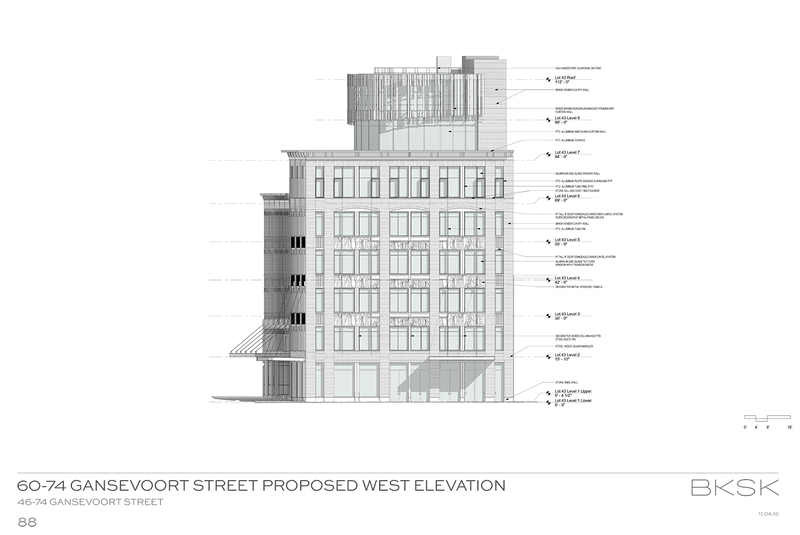 There would be five stories and then a setback sixth floor. 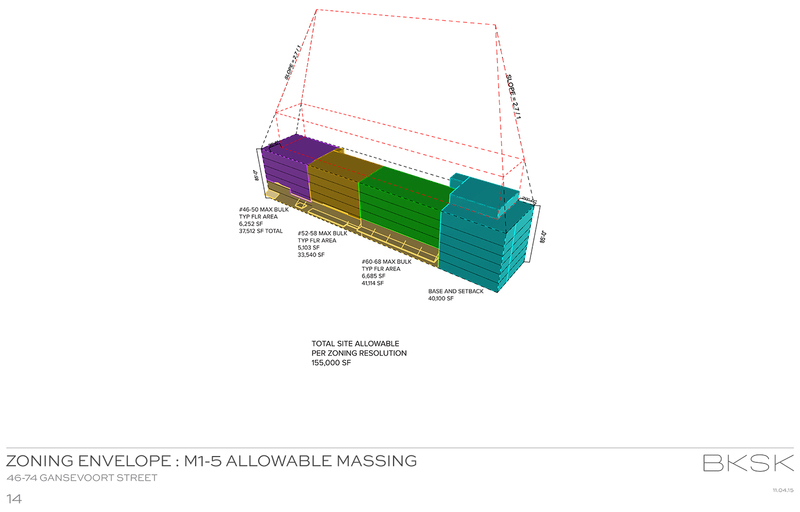 The total square footage would be 41,736. 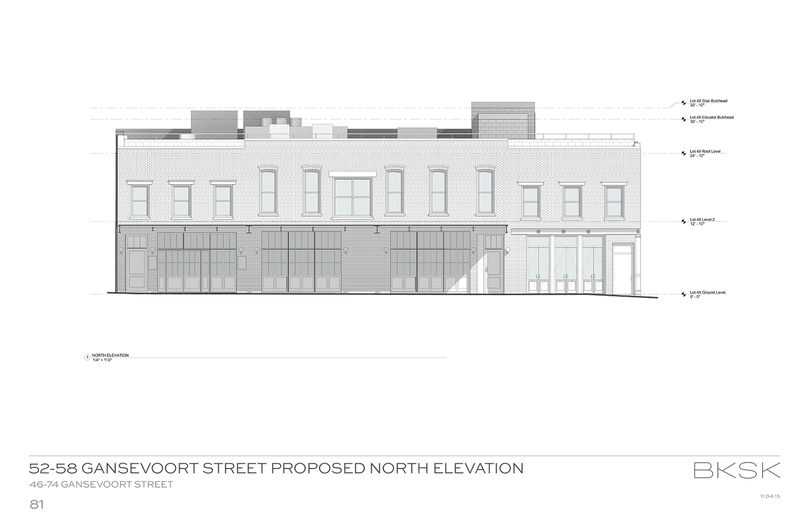 That’s up from the current 17,174 square feet. 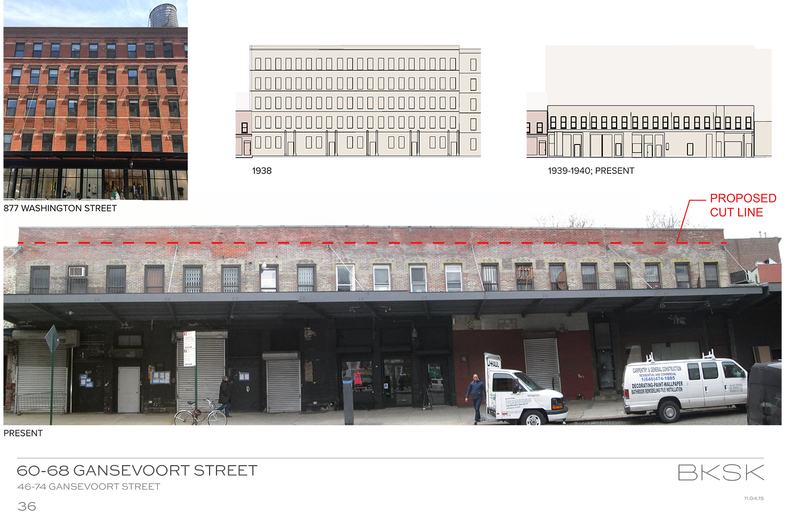 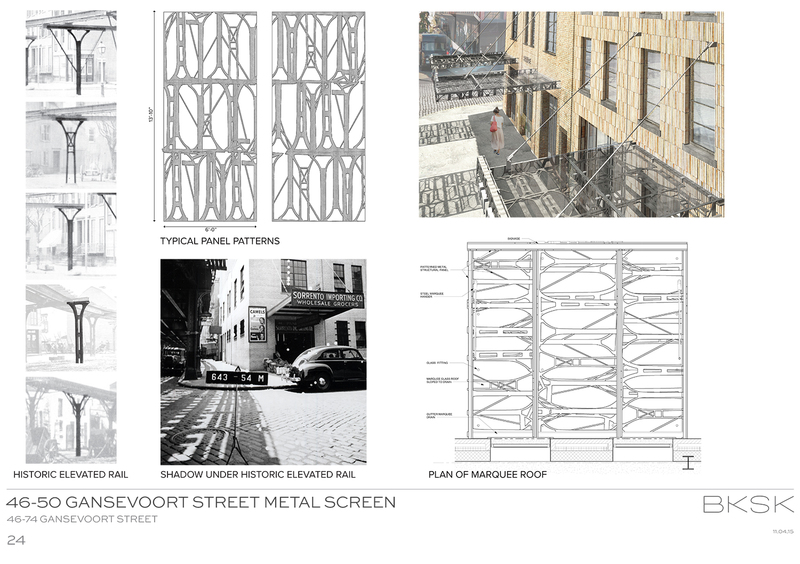 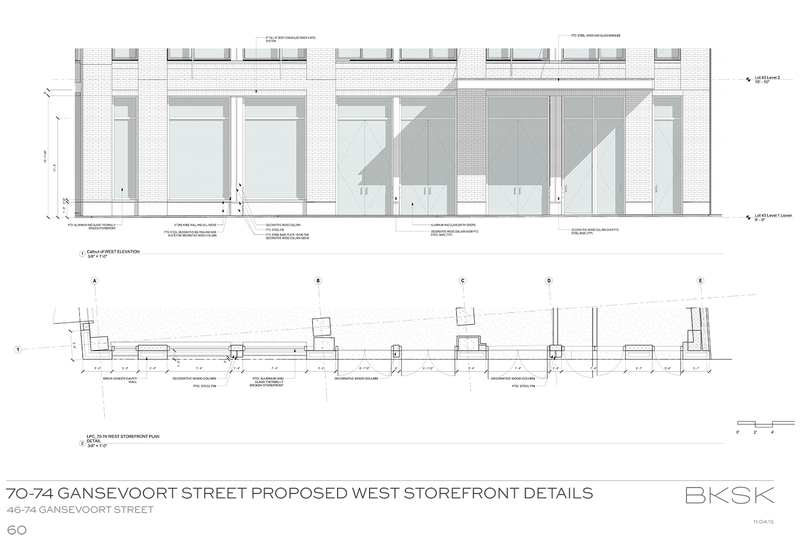 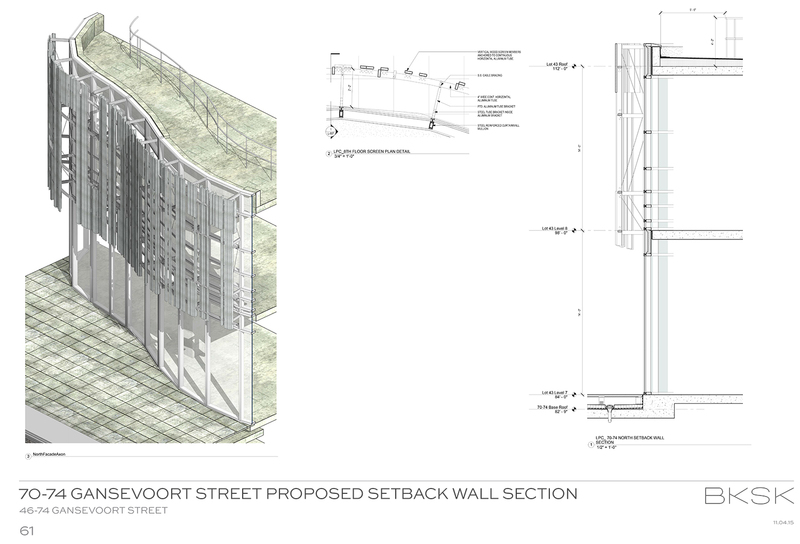 70-74 Gansevoort Street, currently a one-story-tall former truck depot, would be demolished and an eight-story building would be constructed in its place. 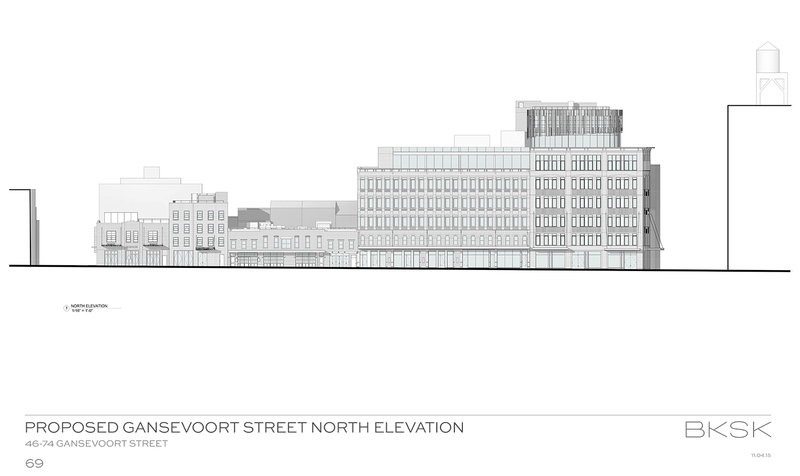 It would have six floors and then a set back seventh and eighth. 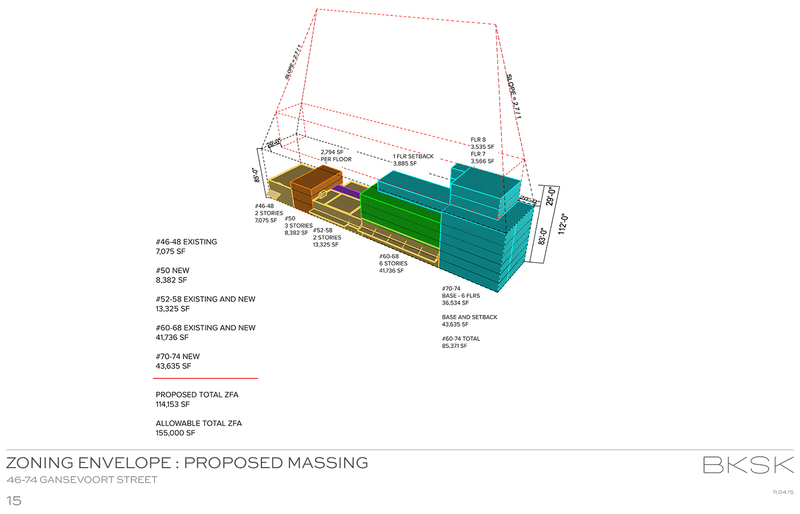 The new building would have 46,636 square feet of space, compared to the current 5,936. 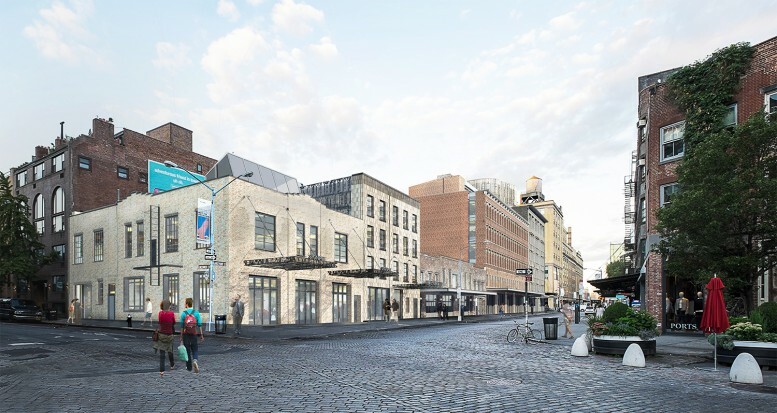 Manhattan Borough President Gale Brewer, City Council Member Corey Johnson, State Senator Brad Hoylman, State Assemblywoman Deborah Glick, and U.S. Rep. Jerrold Nadler are all on record as being opposed to the project. 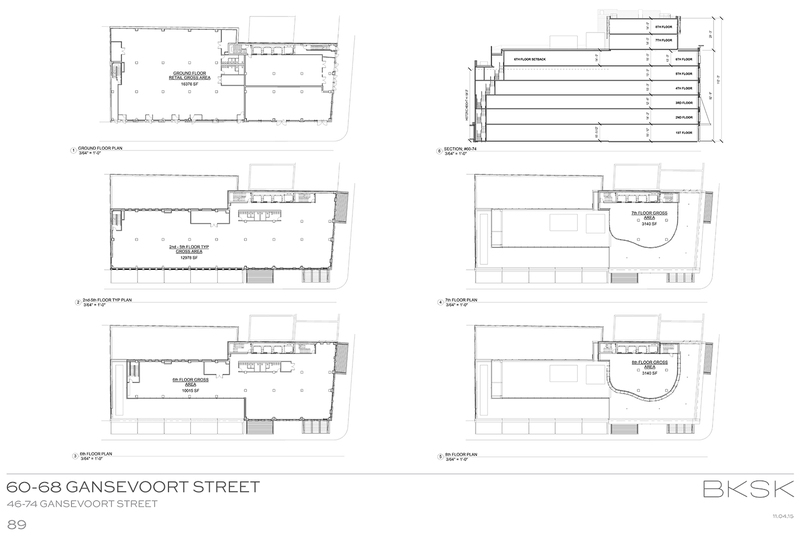 There was an overflow crowd at the LPC hearing room. 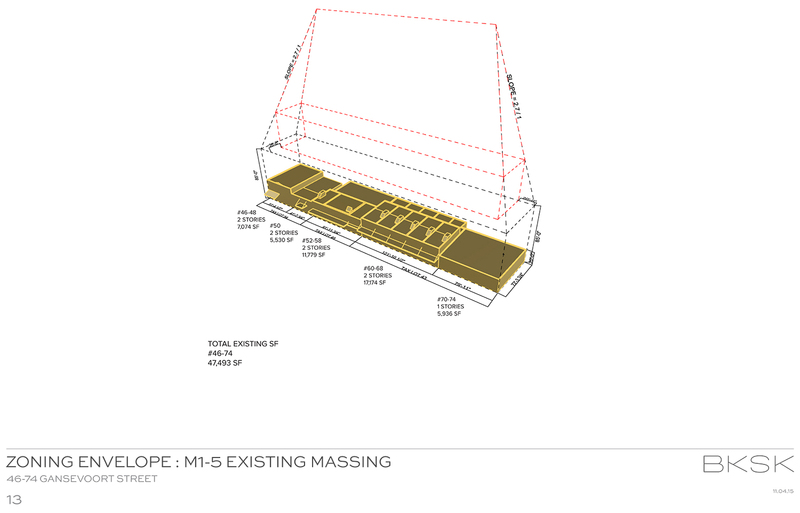 Some people sat on the floor in the aisle. 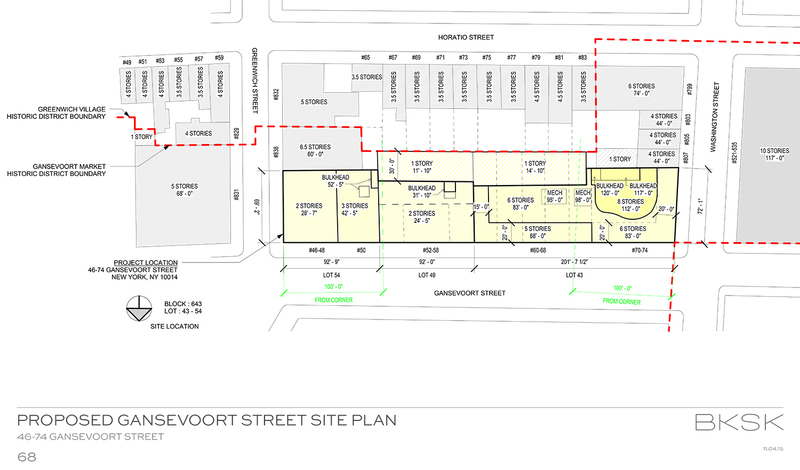 Forty-one people showed up to testify in opposition to part or all of the project. 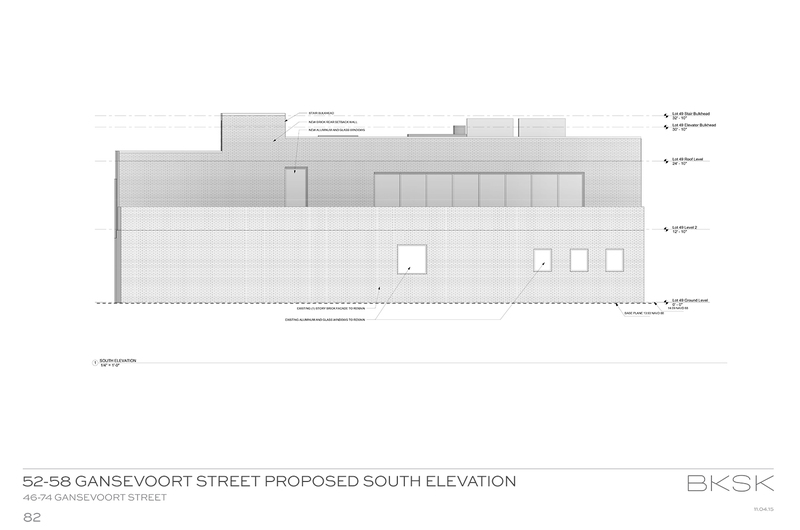 Public testimony took about two hours. 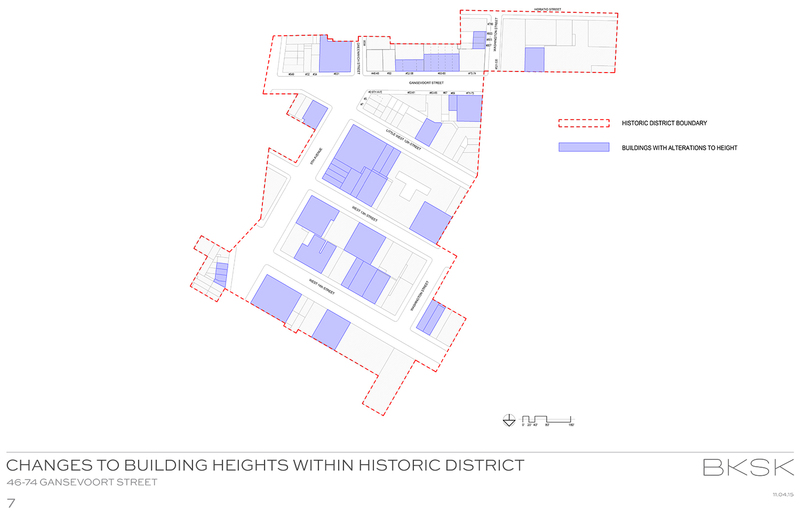 That included residents, business owners, and even just people with a fondness for the neighborhood. 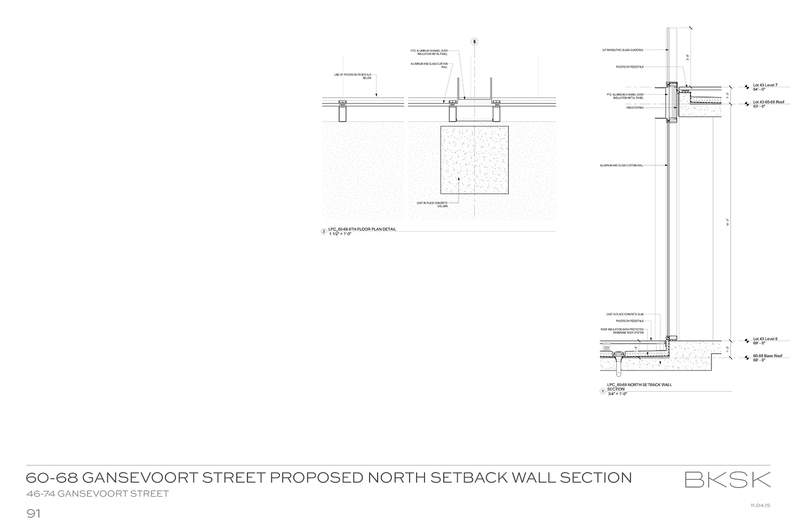 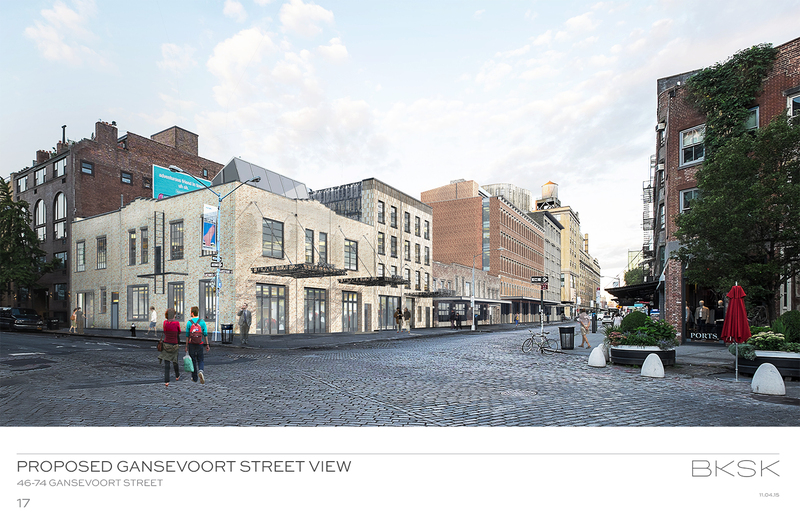 Leading the opposition was the ad-hoc group Save Gansevoort, which has a 2,000-signature petition. 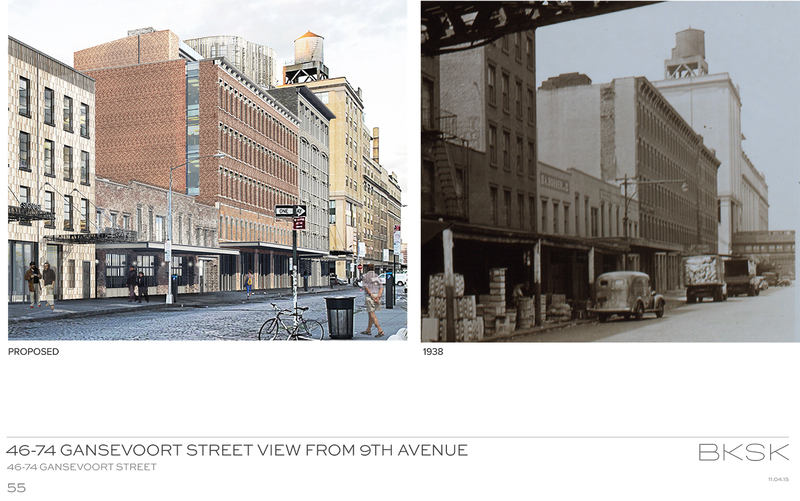 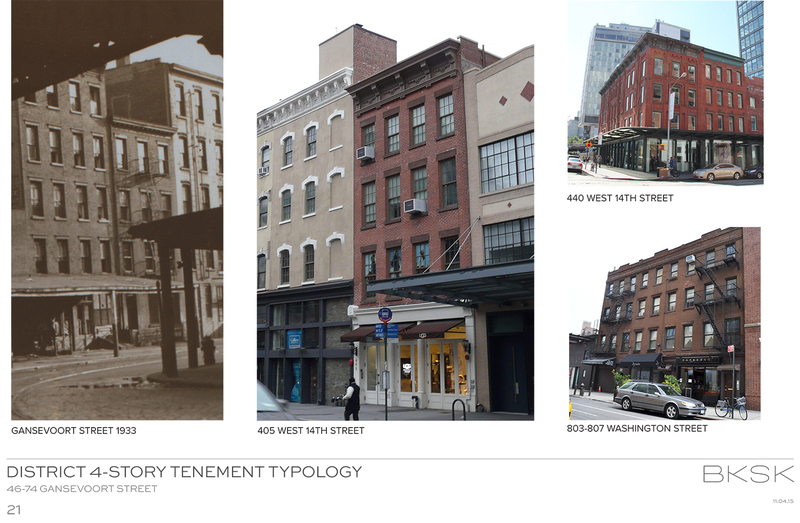 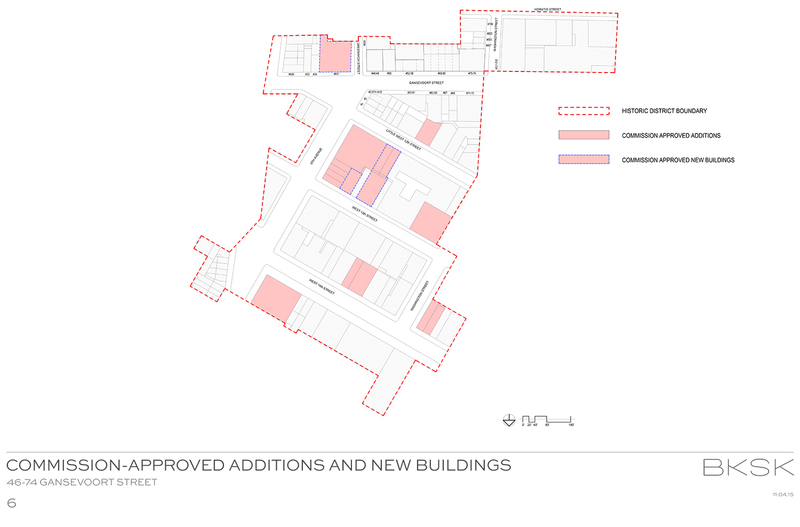 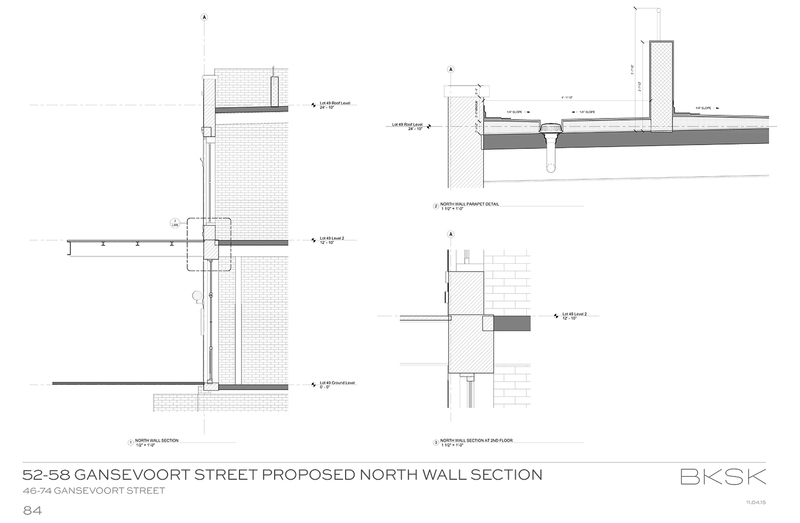 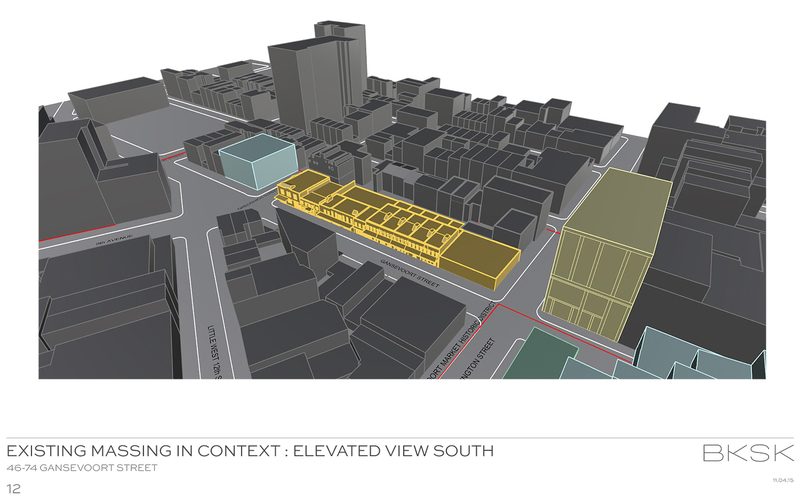 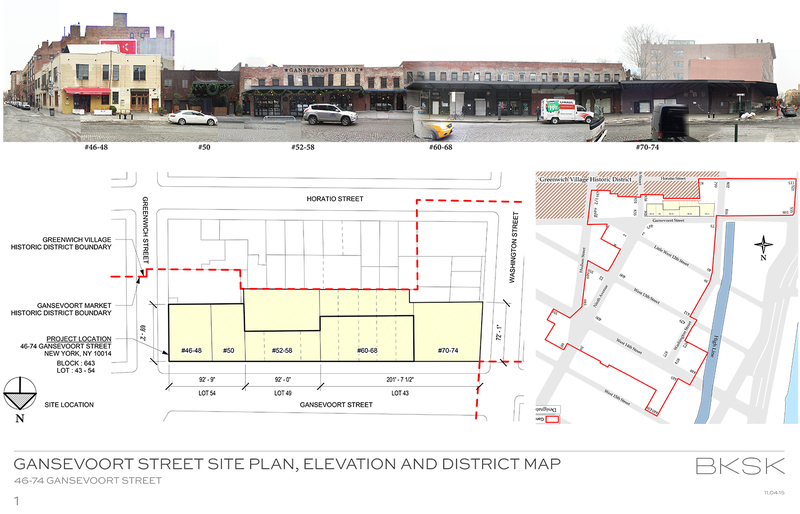 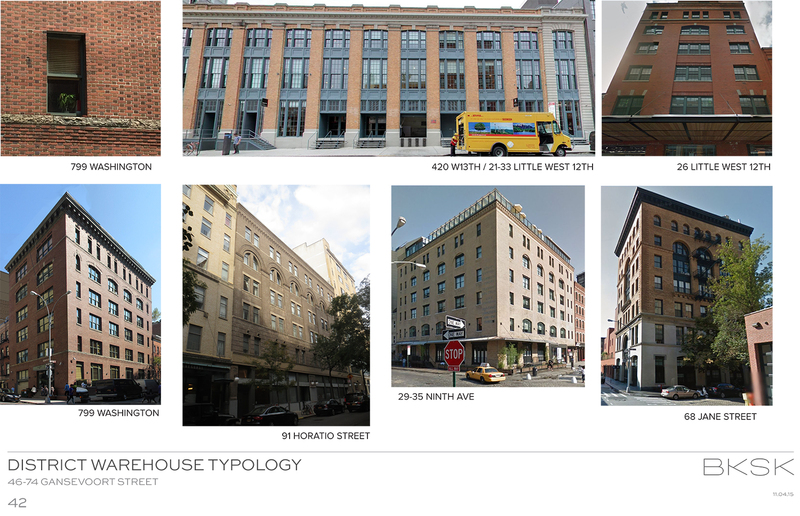 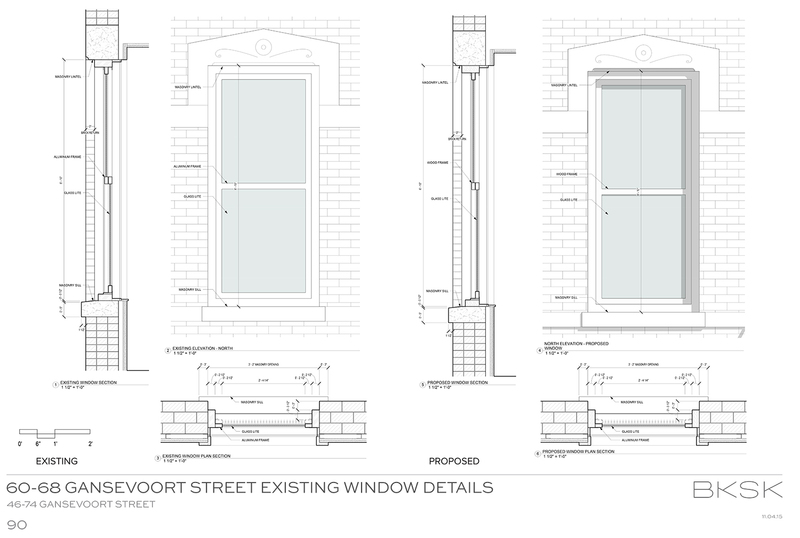 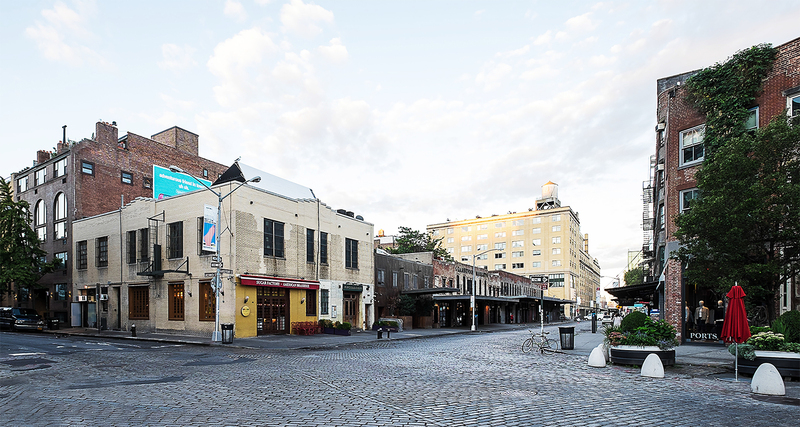 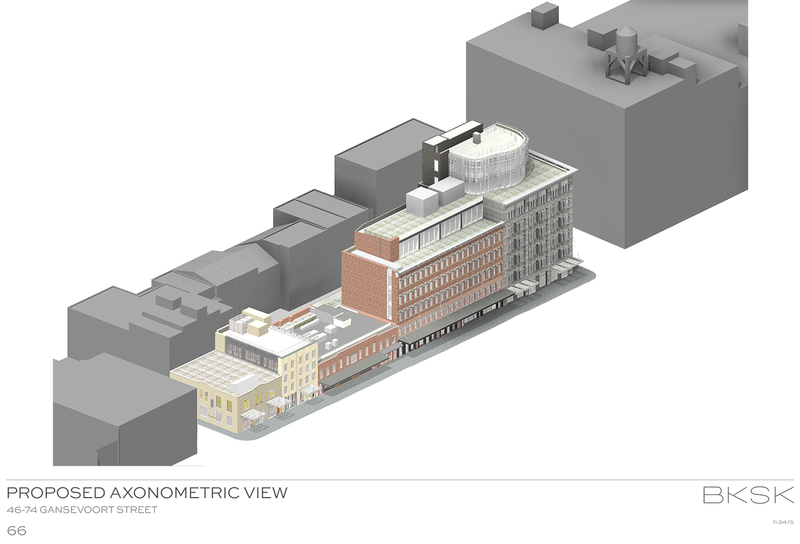 The Greenwich Village Society for Historic Preservation (GVSHP), the Historic Districts Council, and the Victorian Society were also among the groups who testified against the project. 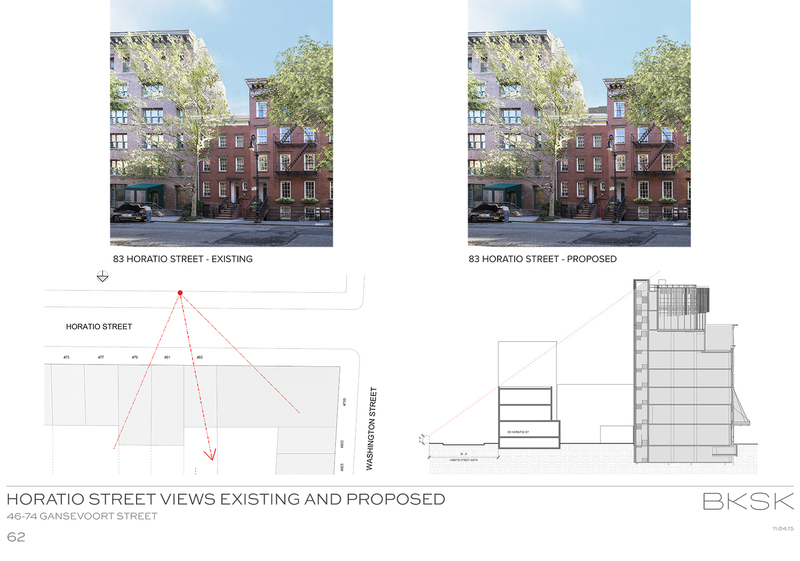 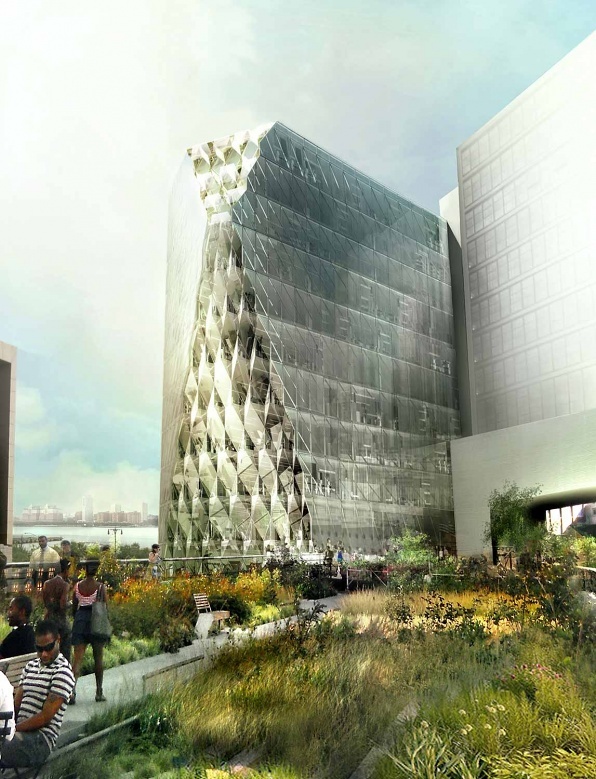 Andrew Berman of GVSHP said the proposal would mean an “obliteration” of the current low-rise environment. 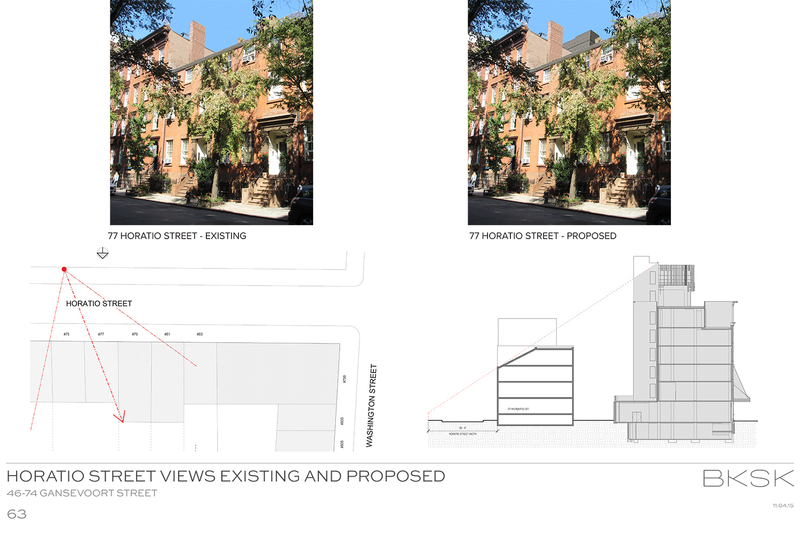 In addition to all of that, the LPC Chair Meenakshi Srinivasan said the commission received 2,300 e-mails opposing the proposal. 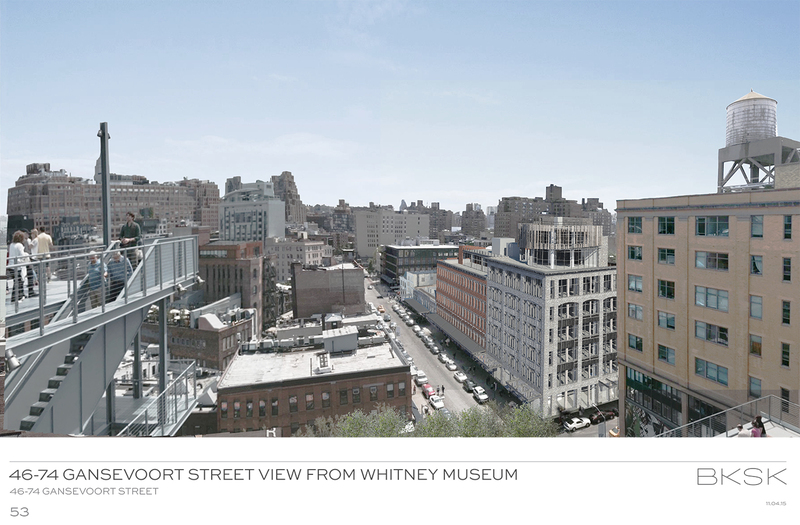 At least two people rose to support the project. 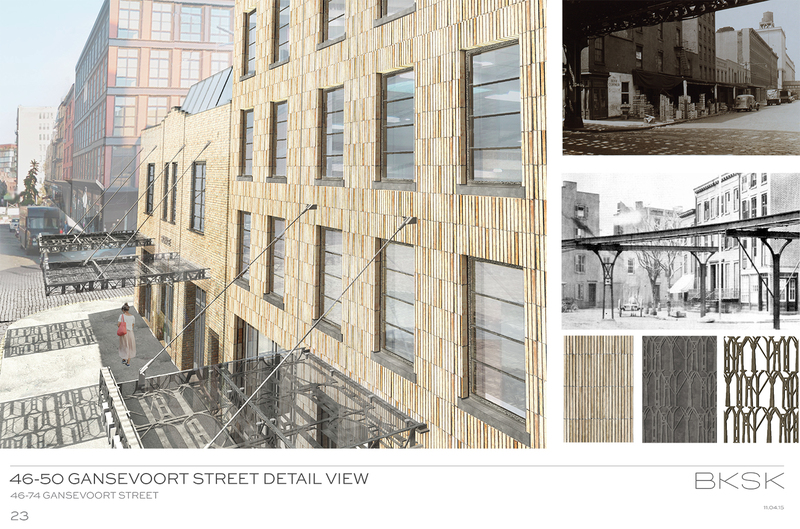 Jeff Holmes of Delshah Capital called it “contextually appropriate.” Another man rose to applaud revitalizing the block and called the approach “sensitive.” Christabel Gough of the Society for the Architecture of City didn’t deliver a full-throated defense of the project, but said that if anybody can get it right, it will be BKSK. 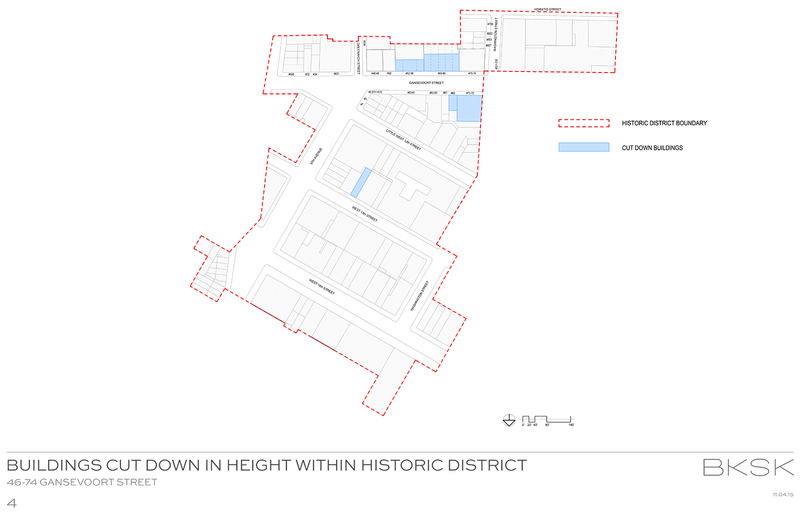 The commissioners took no action on Wednesday, as it was nearly 6:45 p.m. when the public testimony concluded. 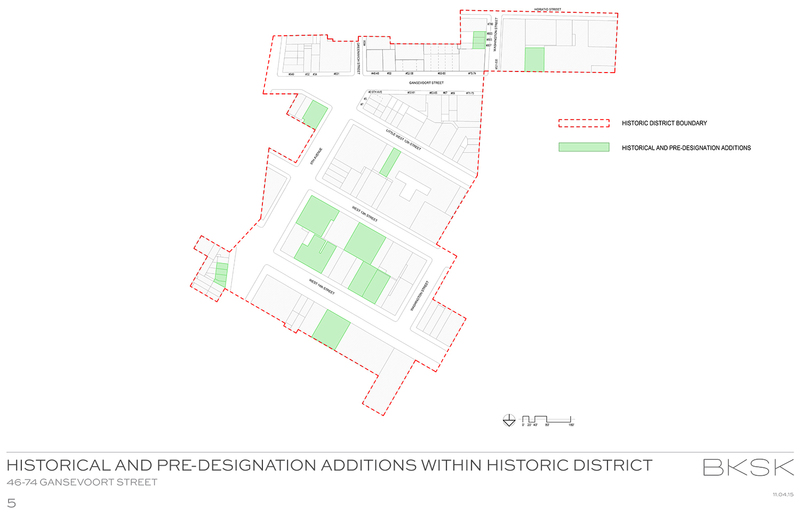 So, the commissioners will let everything soak in and take up the proposal at a future public meeting. 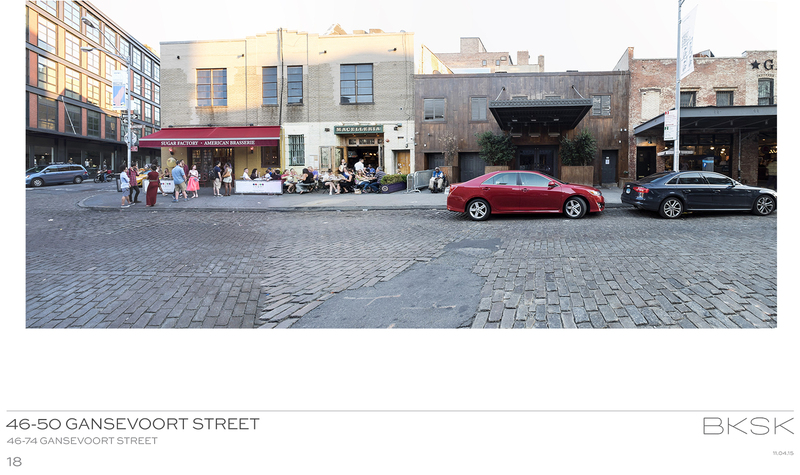 No date was announced.